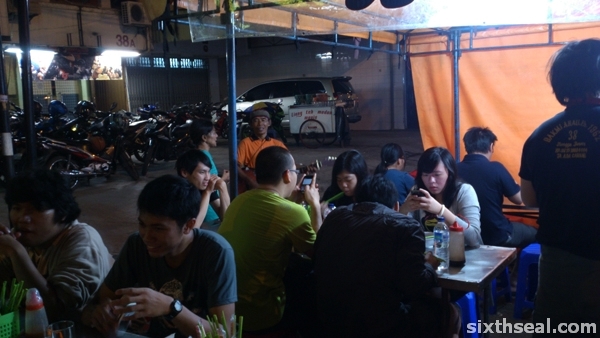 There are several bakmie kepiting (crab bakmi) stalls in Pontianak, all bearing the same name – Oukie. Turns out Oukie was the original guy who brought this dish here and all the current stalls are his descendants (sons, daughters, nephews). Strangely, they all bear the name “Sibu” which my hometown! We puzzled over this. Did the original Oukie come from Sibu? 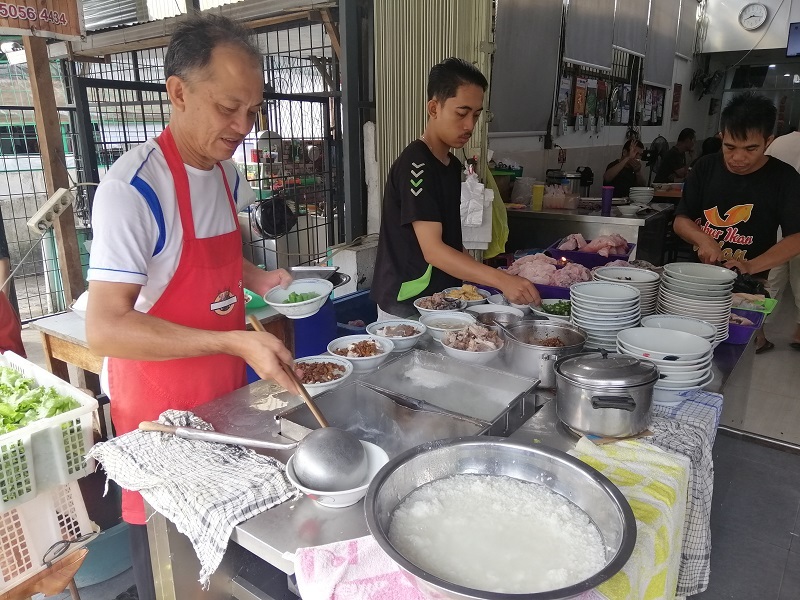 Do they claim that this bakmi is exactly like what Sibu offers? Coz it’s definitely not. We don’t have a similar dish in Sibu. Nothing close. 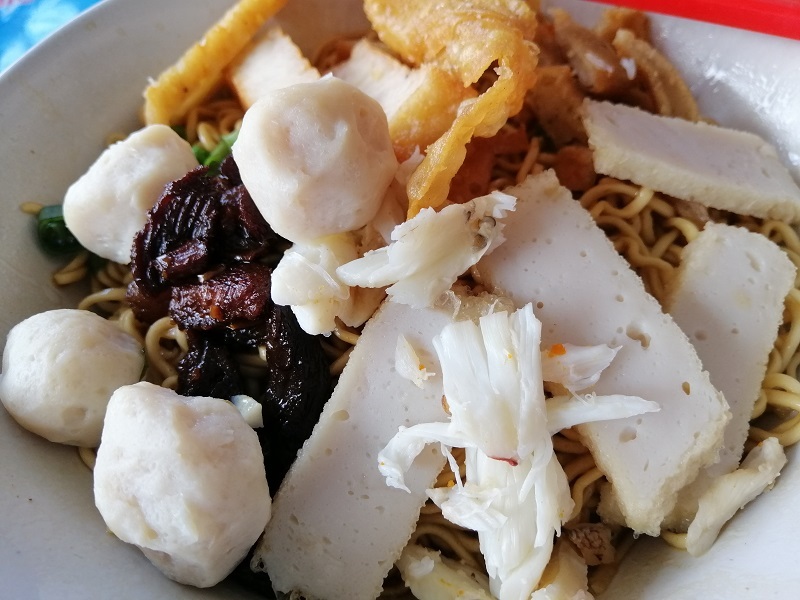 The closest is probably Foochow noodles with crab, which is a relatively new invention. 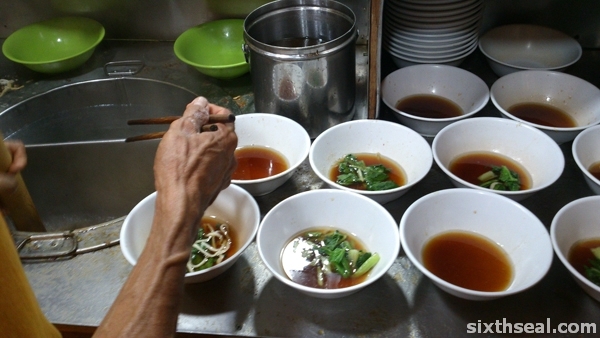 Sometimes Bakmi Kepiting is served with a whole crab claw but these items are in high demand and sell out very fast. They were all sold out at this stall by the time we got there. In addition to the crab meat, there’s fish balls, fish slices and a piece of crispy deep-fried wonton. 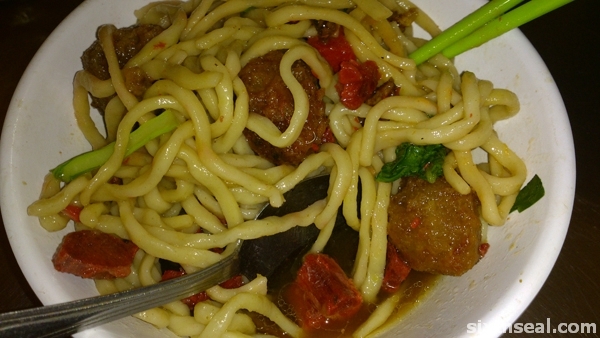 The noodles are tossed with a variety of sauces and you’re served a hot bowl of soup on the side. I really liked these crab noodles! I thought this will be a perfunctory visit just to experience their local noodles but I loved the combination of flavors in this bowl of noodles. It’s very good! 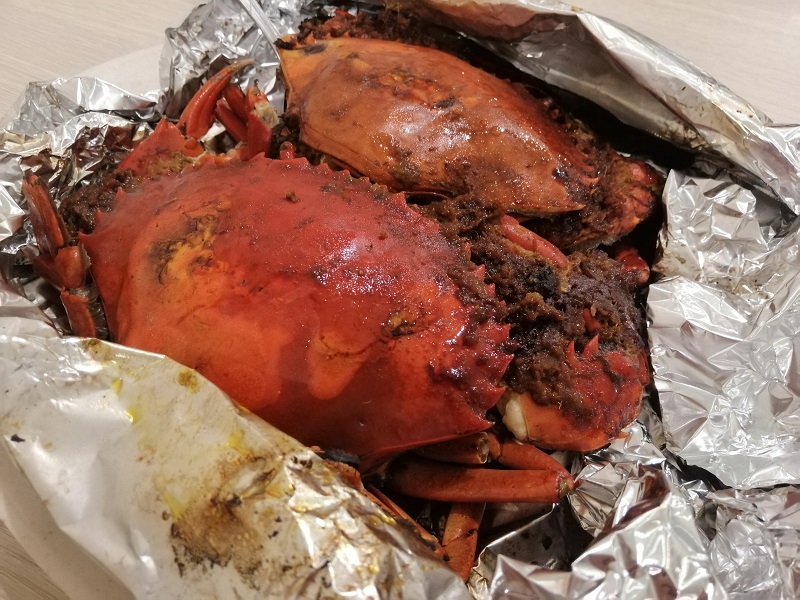 There wasn’t a lot of crab meat though – just a sprinkling, but crab is expensive and this is street food. 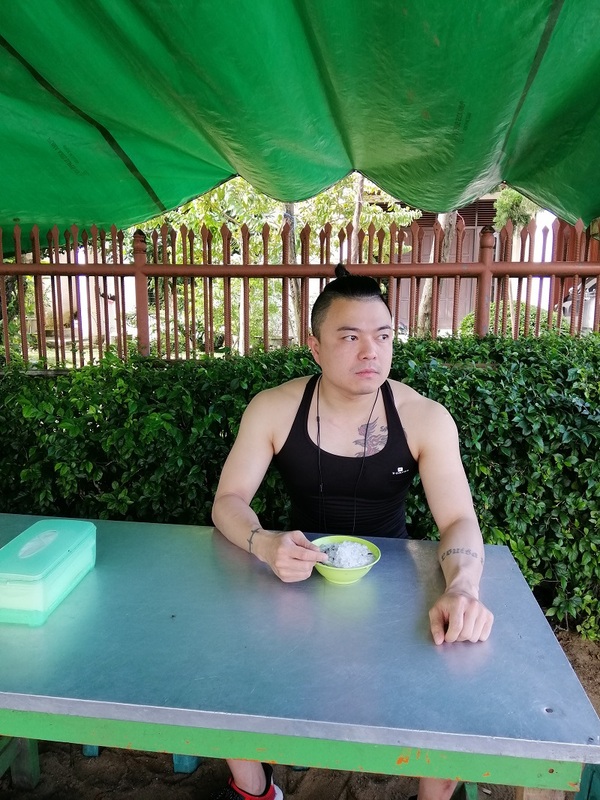 I can’t remember how much it cost coz Bong insisted on buying me breakfast. Cheers! 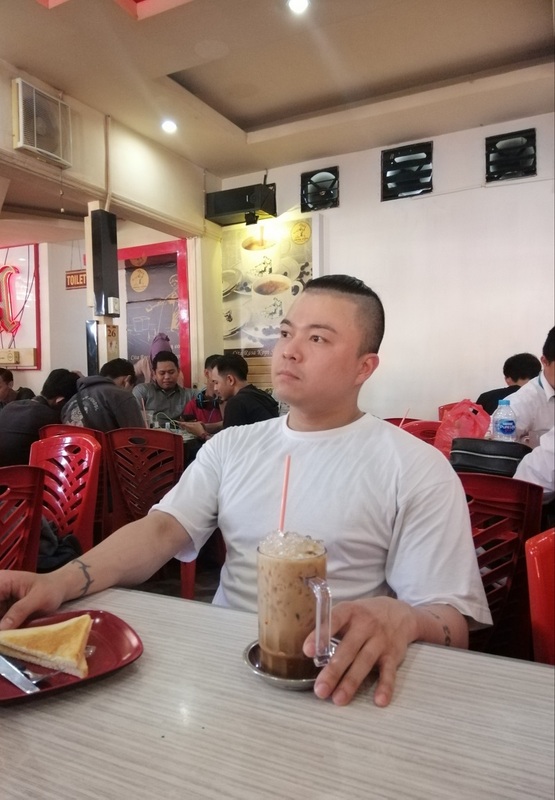 Bong also brought me to this local Pontianak coffee shop. 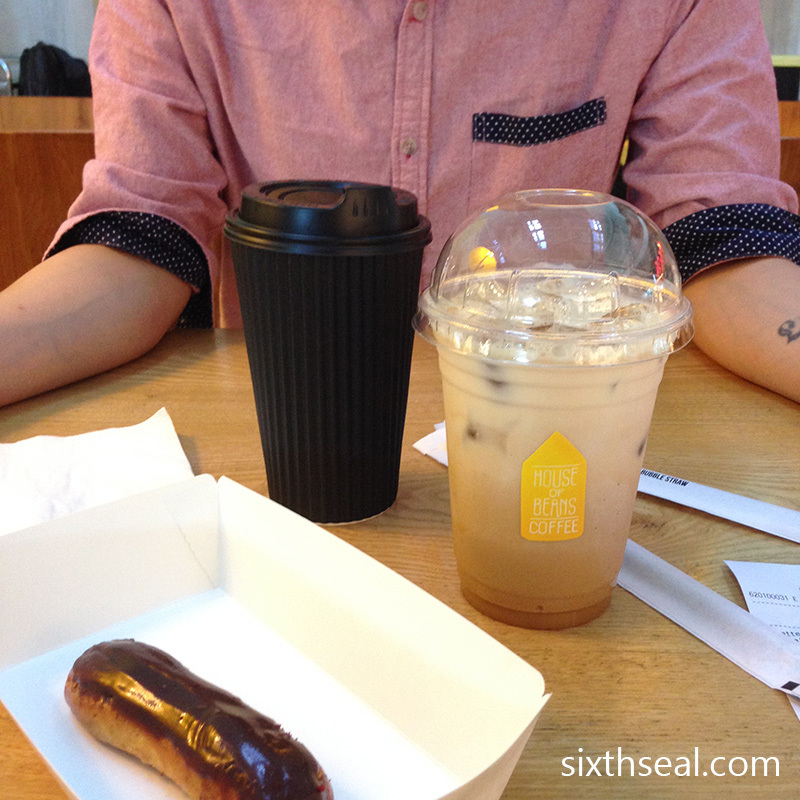 I went to Aming Coffee yesterday and he said this place was very good too. 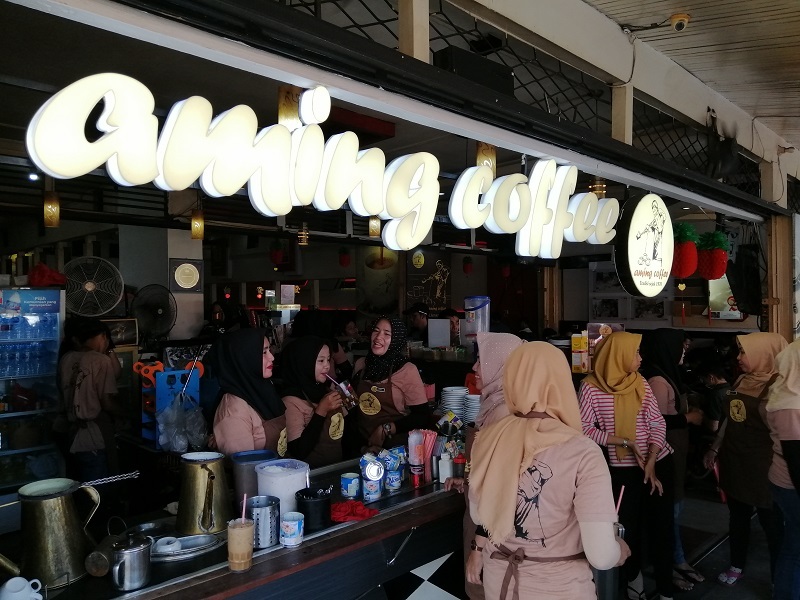 It’s exceedingly packed and we had to take a table under the hot sun but the coffee was indeed excellent! I tried the regular ones without condensed milk this time. 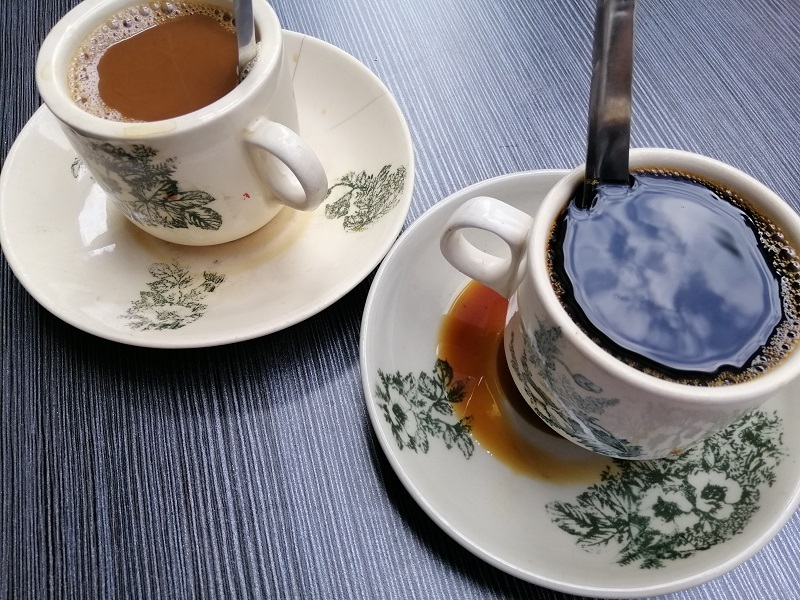 Rich, fragrant and delicious – coffee here is a real treat! You can see the grease slick at the top of my coffee shimmering in the sun. The coffee beans are usually fried with butter or margarine, which is where the oil comes from. 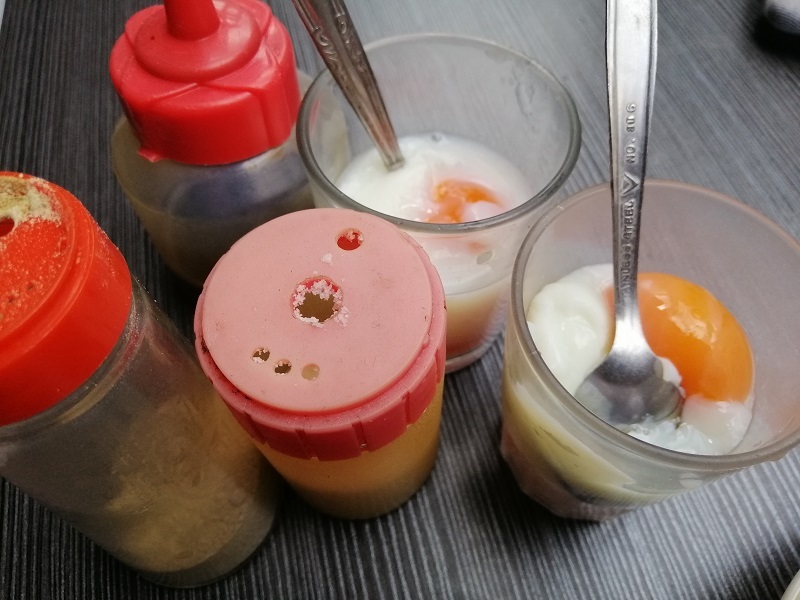 He also ordered soft boiled eggs for us. This was served in a glass, complete with spoon so it’s easy for you to consume. 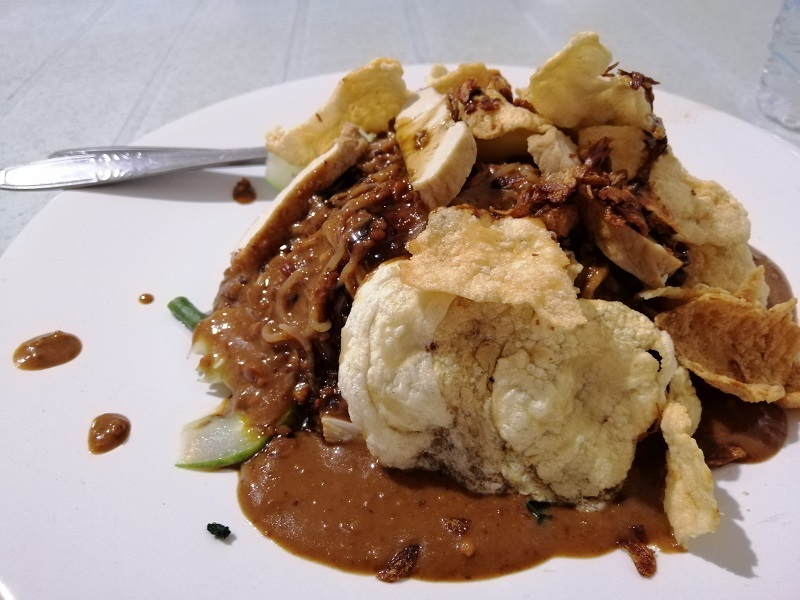 Gado gado is another food item on my hit list. It’s basically a cold noodle dish that’s more like a salad. 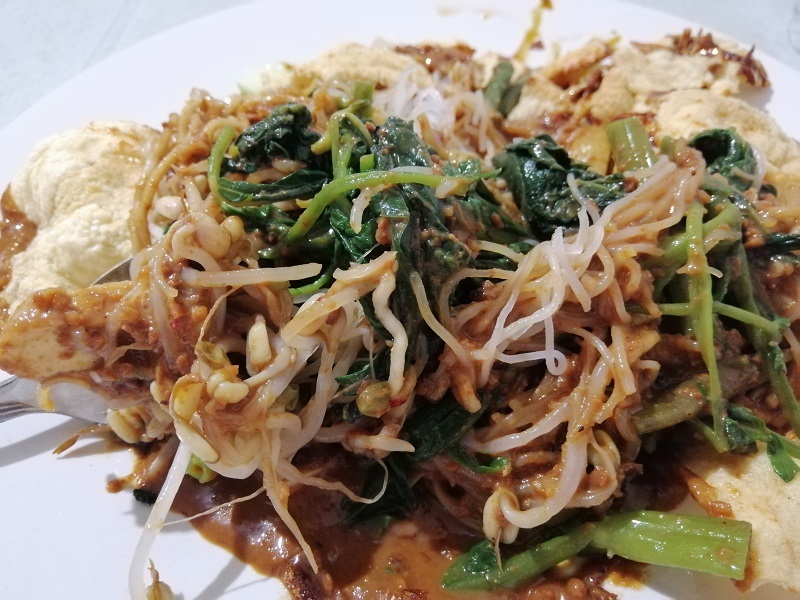 Rice vermicelli is topped with vegetables like bean sprouts and kangkong are tossed with tofu and crackers and the whole thing is doused with peanut sauce. This is what it looks like when it’s served – the different crunchy and soft items make for an interesting dish with good mouth-feel. I enjoyed this one as well! It’s 24,000 IDR (RM 7) for this plate. 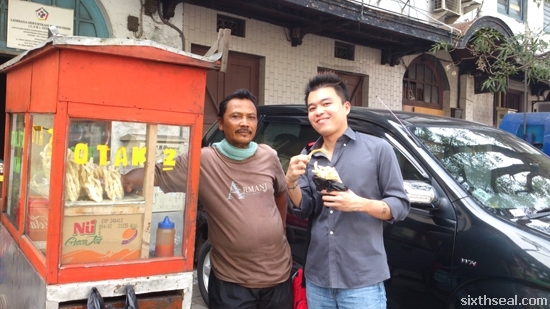 This is probably the most famous ice cream parlour in Pontianak. 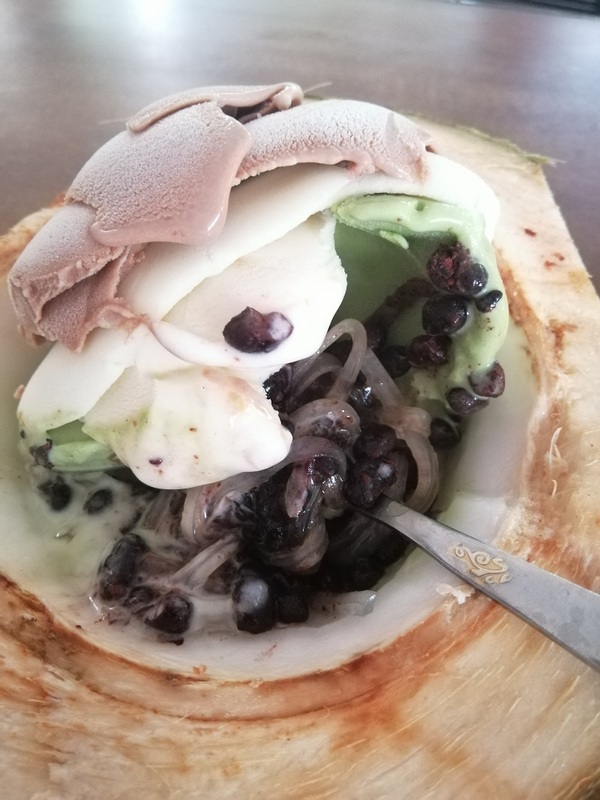 They’re known for serving home-made ice cream in a coconut shell complete with coconut meat you can scrape up and eat together with the ice cream! This “parlour” is actually a converted residential house that’s located beside a Catholic school. The place was *packed* despite being the middle of the afternoon on a working weekday. Motorcycles are the preferred mode of transport here so you’ll see heaps of them parked haphazardly in front. The guys will tell you the flavors of the day and you choose which one you want. 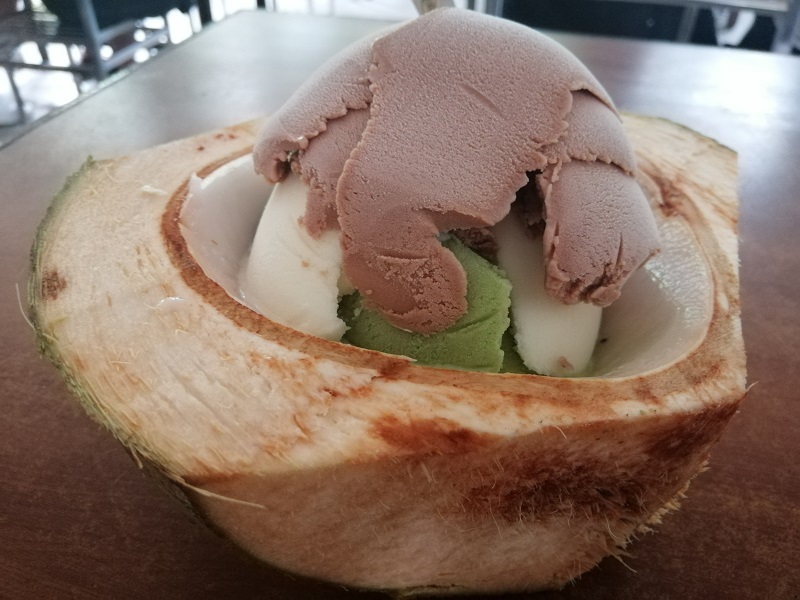 I went for all three – pandan, durian and chocolate. 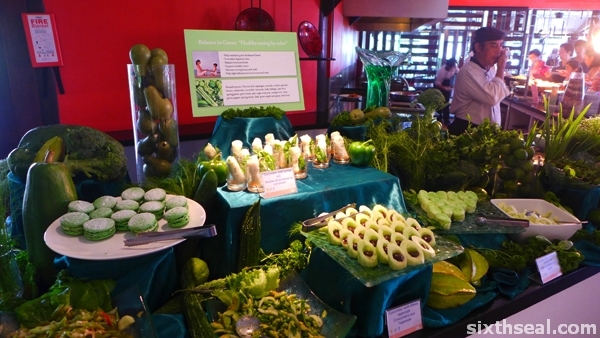 The chocolate and pandan was the best. The ice cream is “sliced” out of the vats with a spoon so you get thin segments instead of a round scoop. I like this format, it makes for good eating! The flat surface fits perfectly on your tongue. You can also choose the toppings you want – all complimentary. I went for a little bit of everything but I liked the squiggly transparent noodles best. 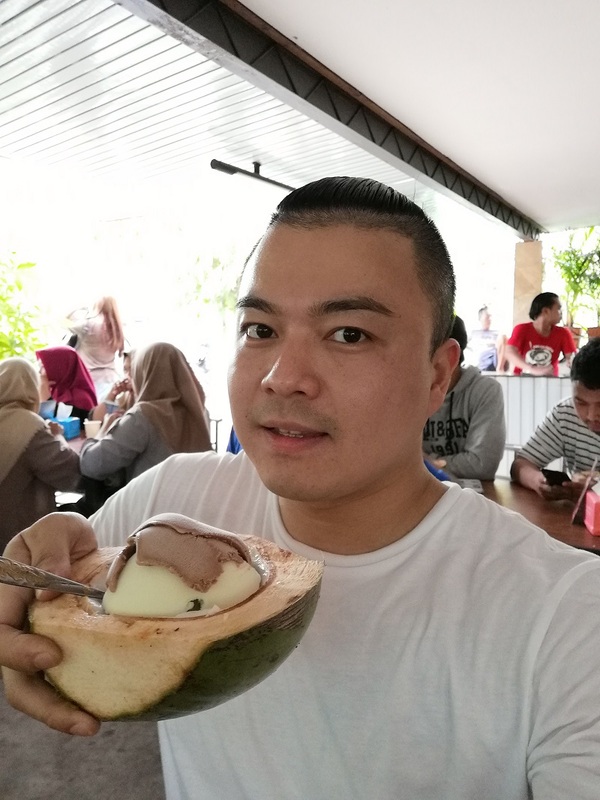 This coconut bowl of ice cream cost 23,000 IDR (RM 6.70). Excellent value! 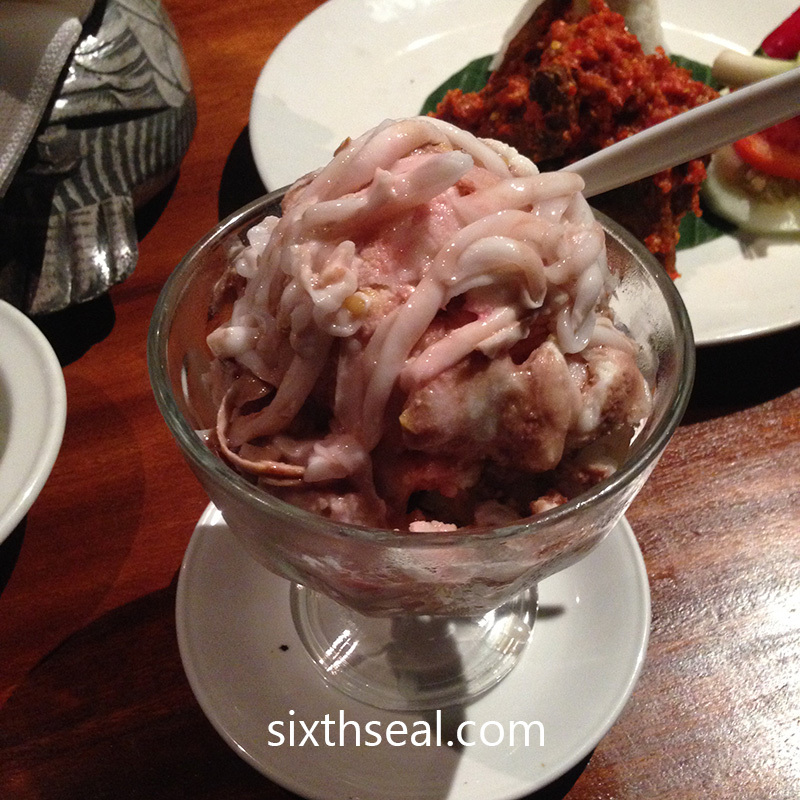 I like the combination of the slippery coconut flesh and homemade ice cream. This spicy duck recommendation came from Bong. It didn’t even register on my radar and didn’t make it to my original list. I’m glad I tried it though coz it’s the best meal I’ve had, other than Pondok Kakap! 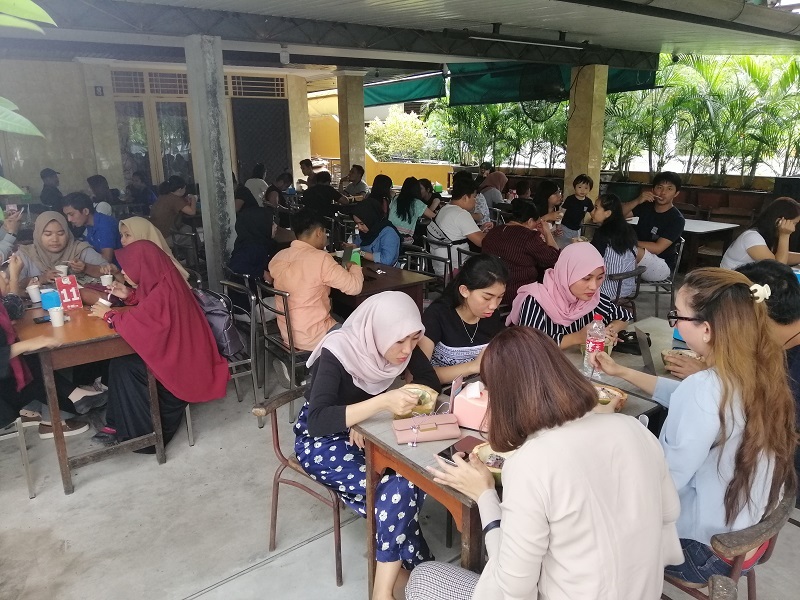 This restaurant is in a huge wooden complex and I saw many Gojek and Grab Food drivers waiting in line to fulfil food deliveries. 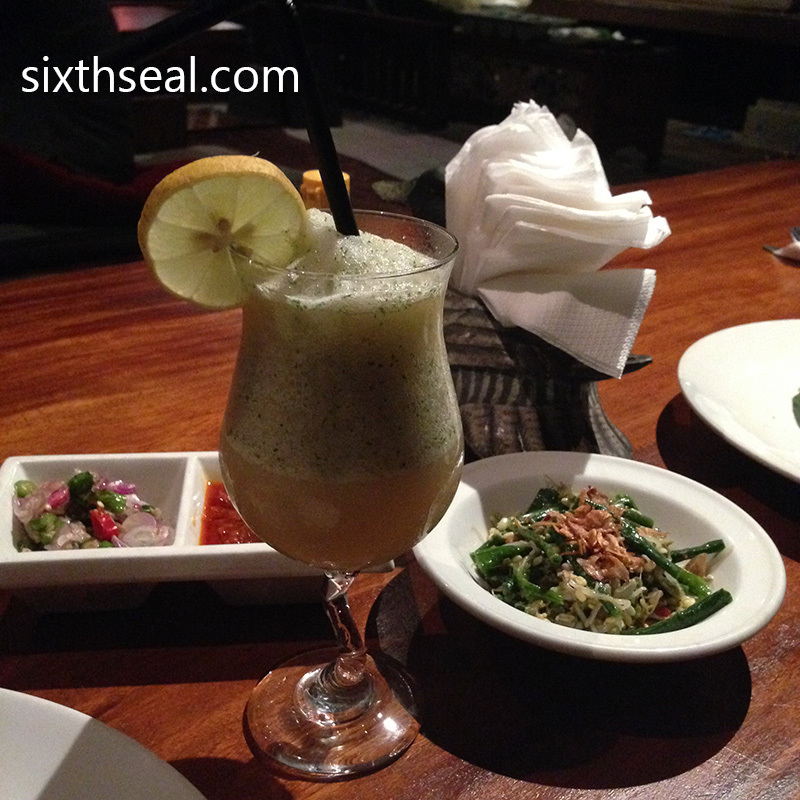 To drink, we have an iced mango drink called Es Mangga Boedjang (15,000 IDR) with mango cubes at the bottom. This came recommended by the menu and the waitress but it was so sweet I didn’t care for it. 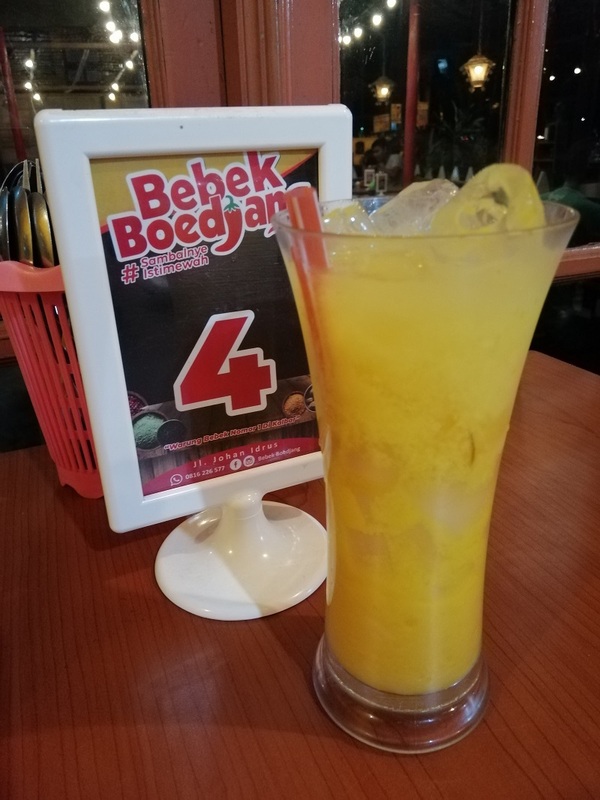 I find most drinks in Pontianak overly sweet and cloying but if you like tons of sugar in your drink, you’ll enjoy this. 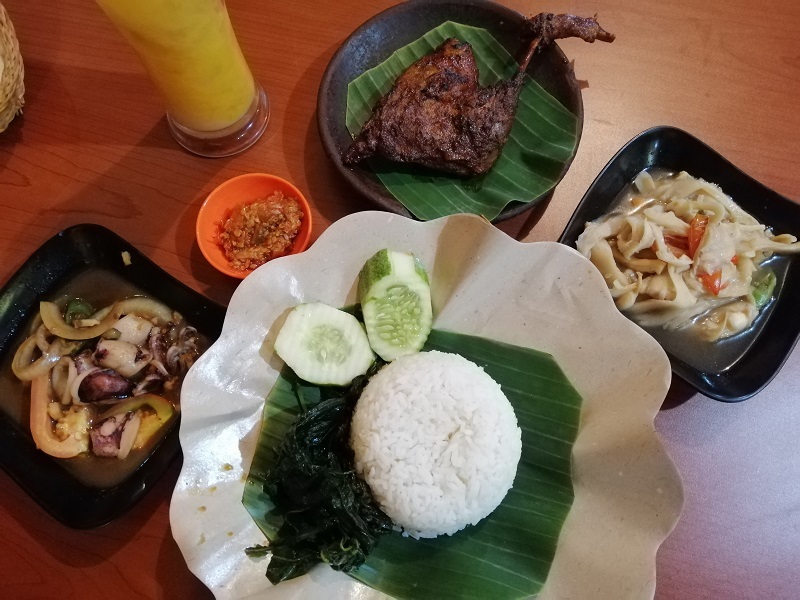 Bebek Paha Bakar Bumbu Rica (30,900 IDR) is the main event! This is smoked duck leg with spices. 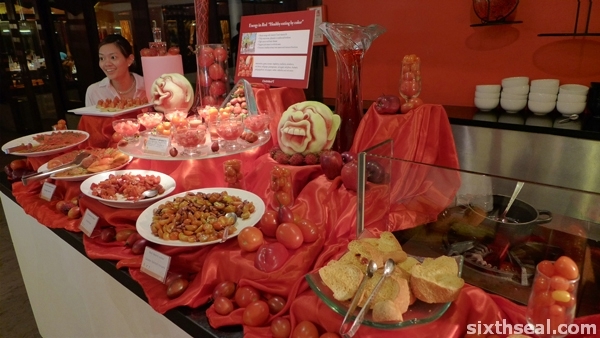 It’s served with rice, which is a 5,500 IDR add-on. The duck leg is still fork tender and has an intense smoky quality that I enjoy. The spices are a sweet-spicy blend that lends itself very well to nice. I wish I had space for 2 of these babies. 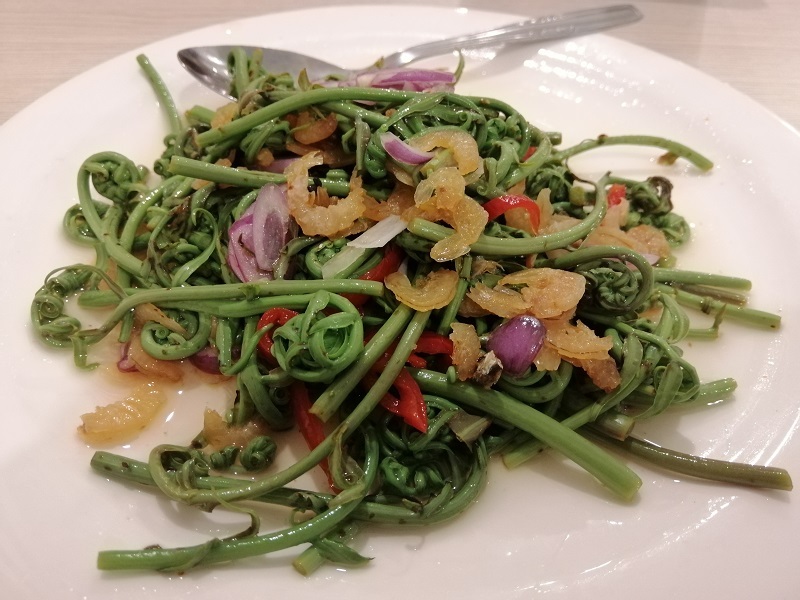 Cumi Tumis Cabe Ijo (16,960 IDR). 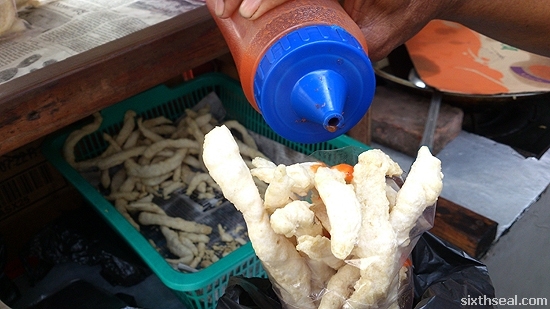 Cumi means squid (sotong) in Indonesian. 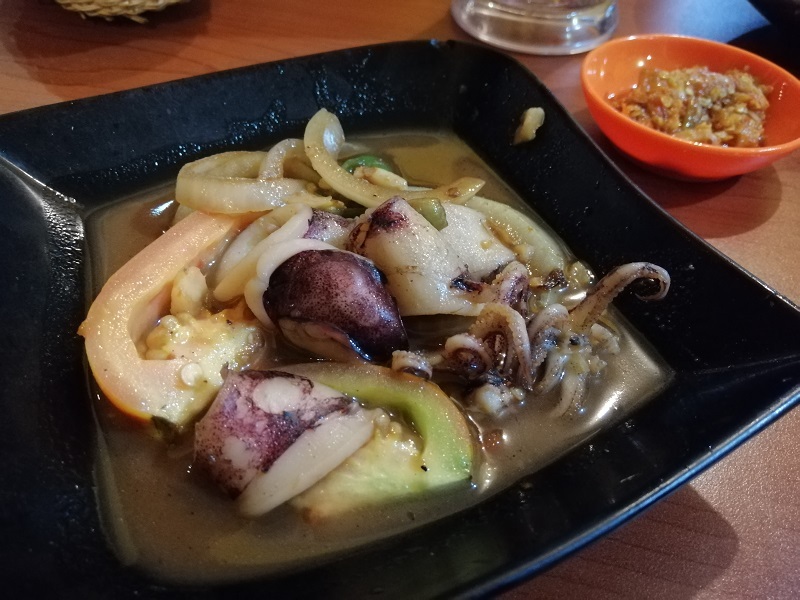 This is one of their flagship sides – squid cooked with green chillies. Wow! Does it pack a flavour punch! I was almost knocked out by the sheer intensity of seasoning on my palate. Welcome to Flavortown! There are tomatoes to add umami, onions for that pleasing aroma, tender squid and a gravy that’s sweet/salty/spicy. I used all of the gravy with rice, and when my rice was finished, I drank it by the spoonful. 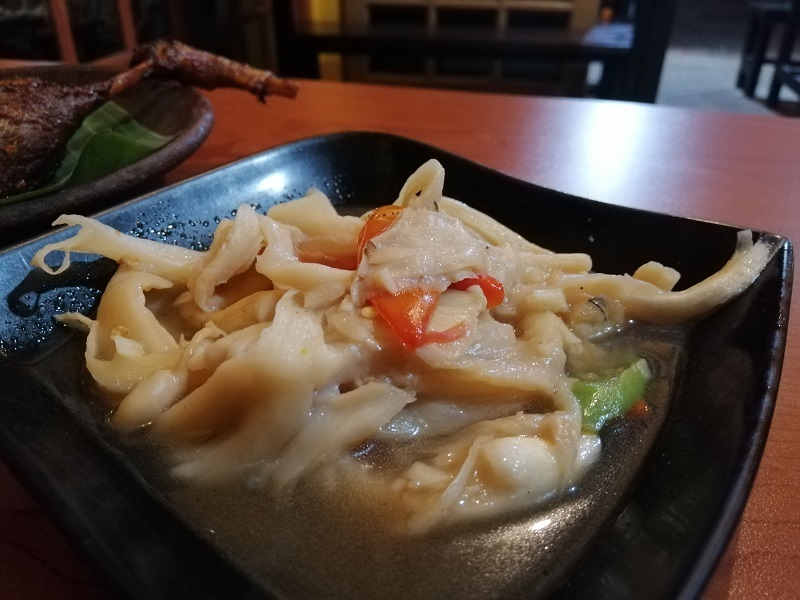 Tumis Jamur Tiram (9,790 IDR) is another one of their signature side dishes – oyster mushrooms cooked in some kind of sauce which hits all the 5 flavor profiles at once. There’s some insane flavouring alchemy going on here. Delicious. I left Bebek Boedjang a very happy man. 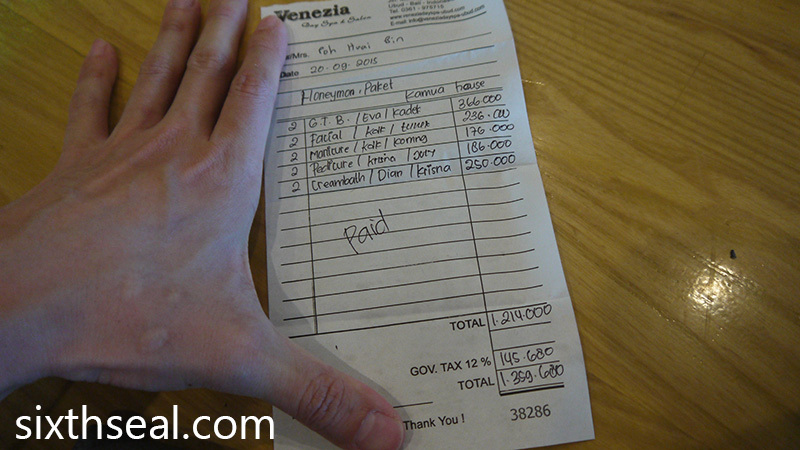 The bill came up to 78,100 IDR (RM 23). That’s an exceedingly fair price for such a decent spread. An excellent meal that I wish was closer so I can partake of it once a month. I have read stories about these two neighbours. 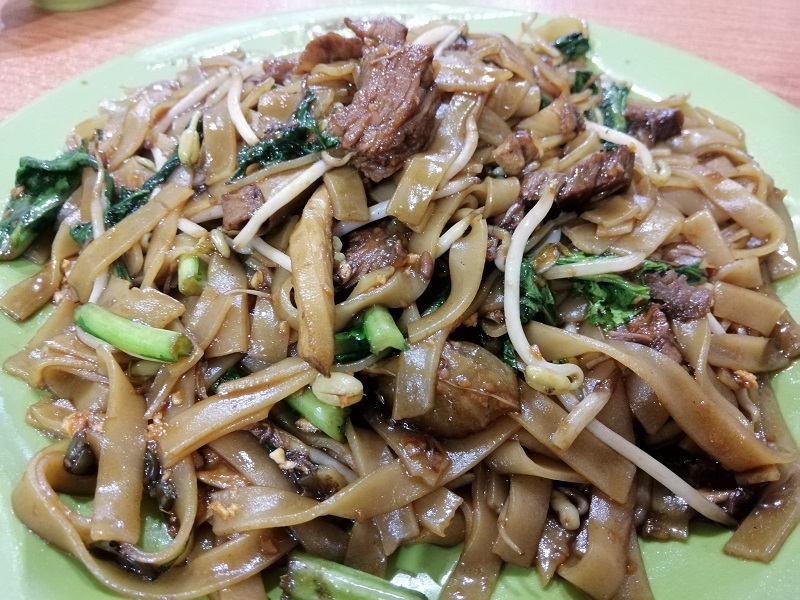 Apollo was the original beef kueh tiaw and is run by siblings. Unfortunately, they had a huge falling out one day. 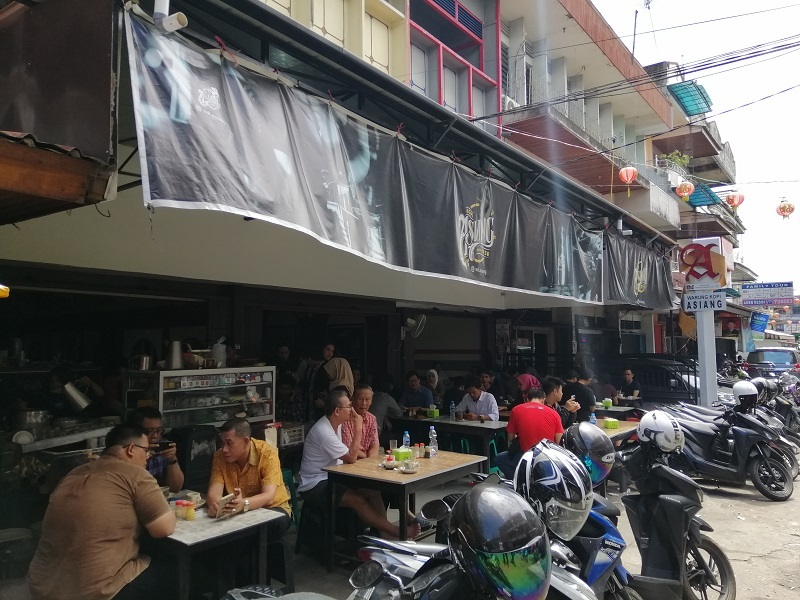 One of the brothers moved out and rented a shoplot right beside Apollo and called it Mie Tiau Polo. They even had snarky signs put up! 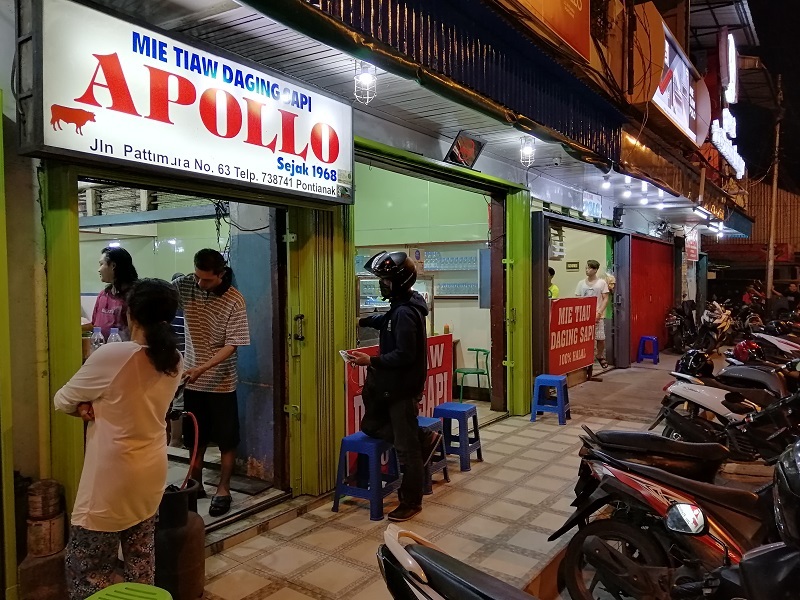 Apollo said “Mie Tiaw Apollo. Sejak 1968. 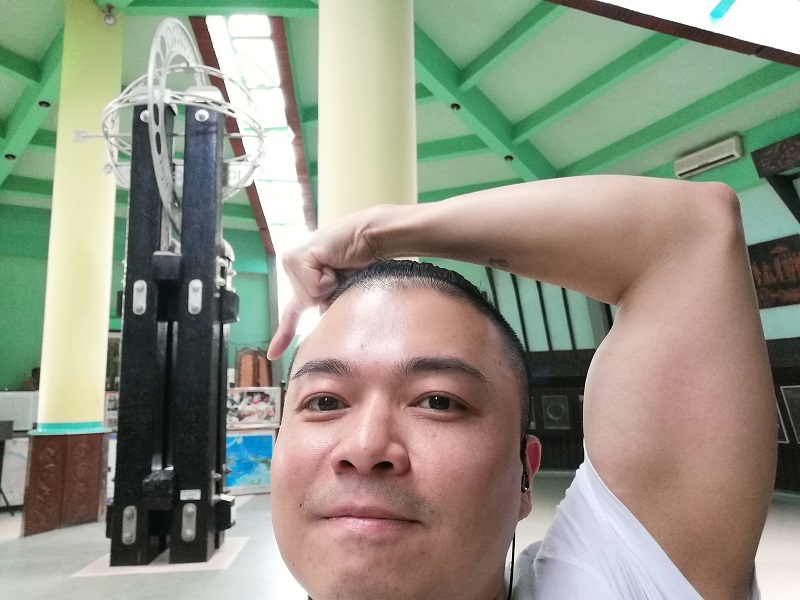 Tak Pernah Pindah.” (Apollo Mie Tiaw. Since 1968. Never Moved.). Polo put up one that read “Mie Tiau Polo. Pindahan Dari Sebelah.” (Polo Mie Tiau. Moved From Beside.) I thought that was hilarious! Unfortunately, the crabby signs have since been taken down so you can only see them in Google Images. 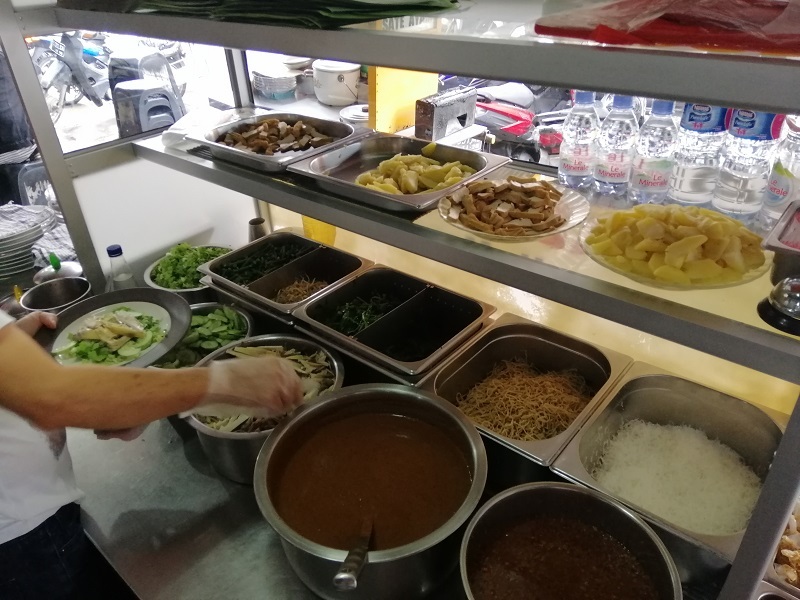 They only serve one thing – beef mie tiaw (which is something like kueh tiaw). They use all parts of the beef, including innards. 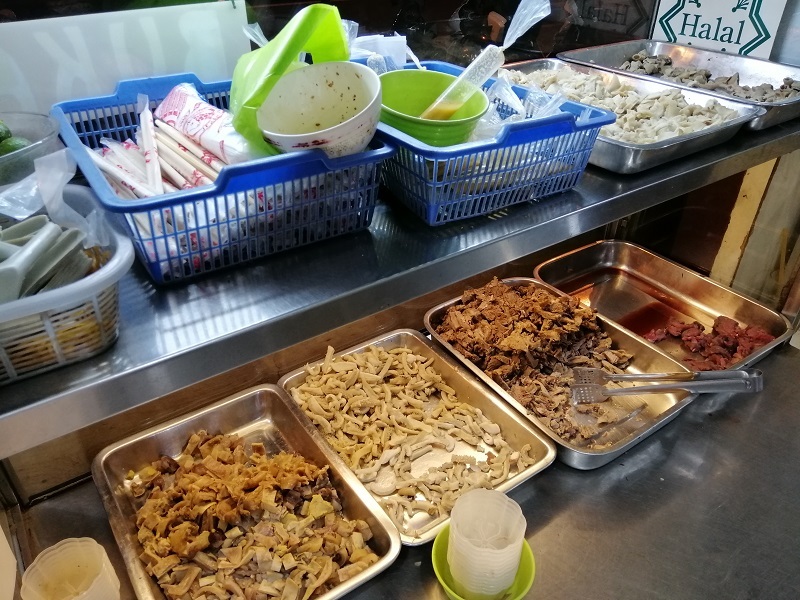 You can see tripe, beef slices, tendon and even stomach on offer. The mie tiaw is fried in huge woks on high heat and the beef parts added. 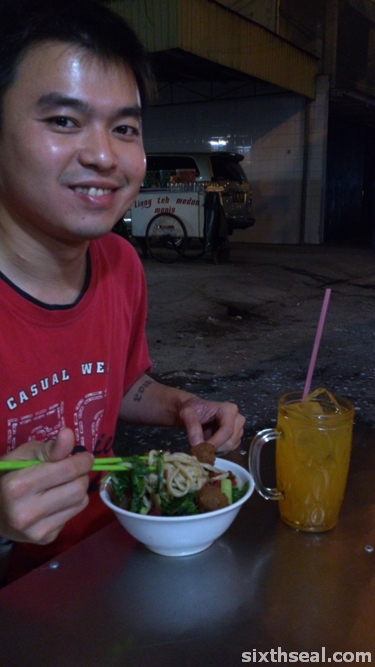 I went to the original Mie Tiaw Apollo and the version they do is a wetter style. This isn’t as wet e.g. gravy filled as local Malay kueh tiaw but merely very moist. It’s also quite oily! The sodium levels are really high too. I found it almost unpalatably salty and had to struggle to finish it. I might enjoy it more if it were less greasy and salty coz the beef tasted pretty good and the flavors were decent. It’s 28,000 IDR or RM 8.50. What is this, you might ask? 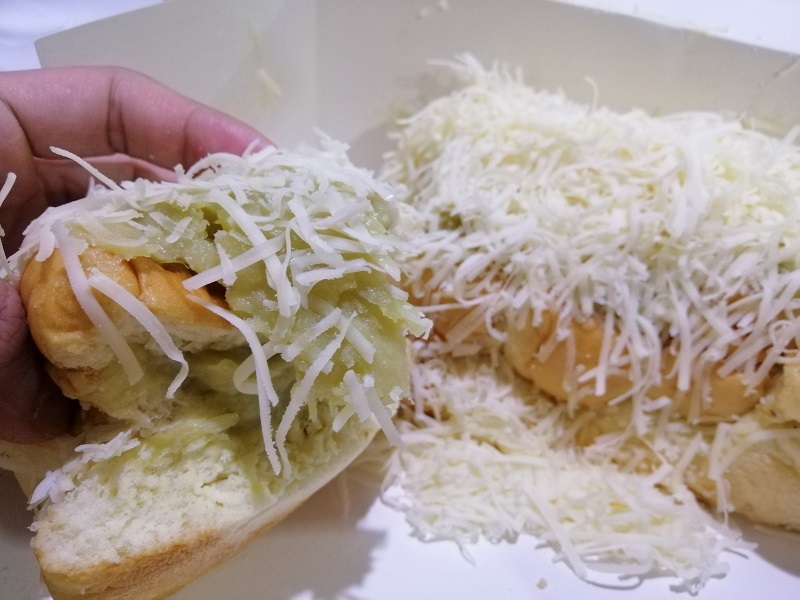 It’s a loaf of bread spread with durian jam and sprinkled liberally with grated cheese. If that sounds awesome to you, you’re at the right place! 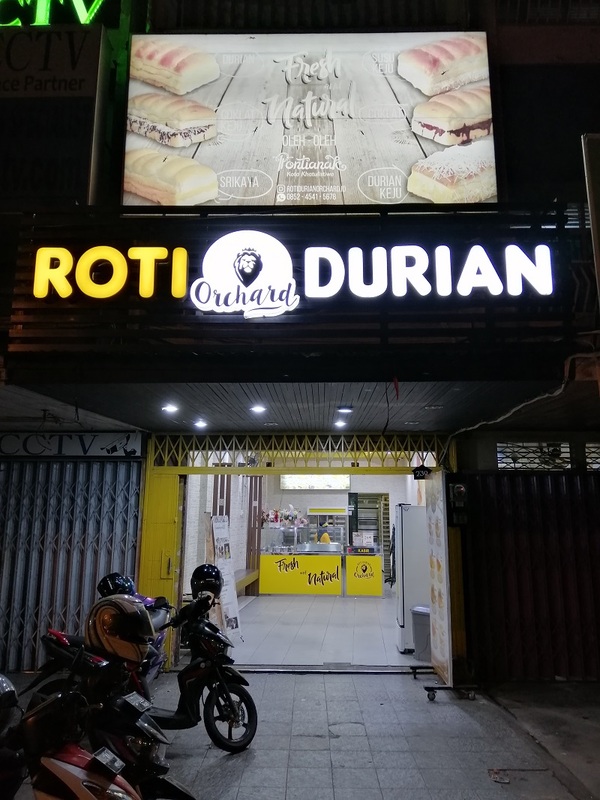 I didn’t know Pontianak is famous for this and only chanced upon this beacon of light while walking back from Apollo. I popped my head in and asked what they serve and immediately decided to try. 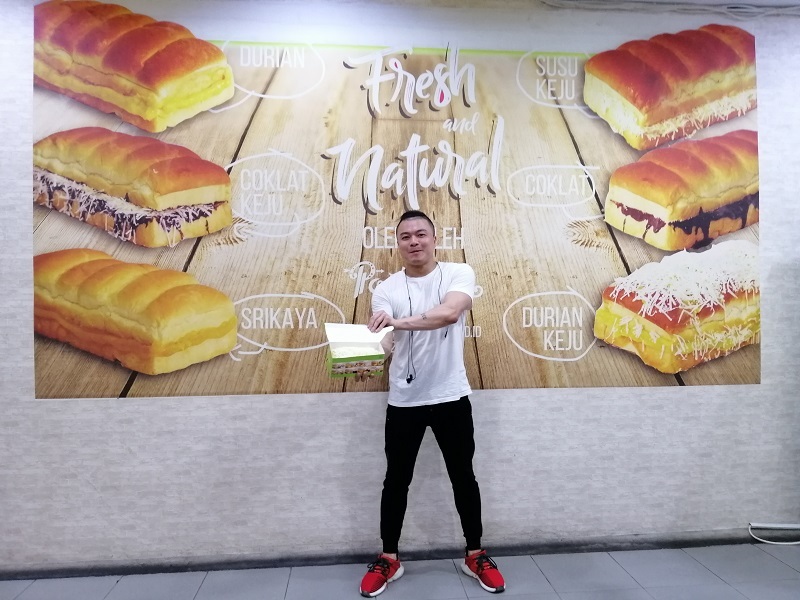 The loaf of bread is actually made up of 5-6 long buns and the clerk slices it in half and spread massive quantities of durian jam into the soft pillowy bread. The entire shebang is then topped with prodigious amounts of grated cheese. 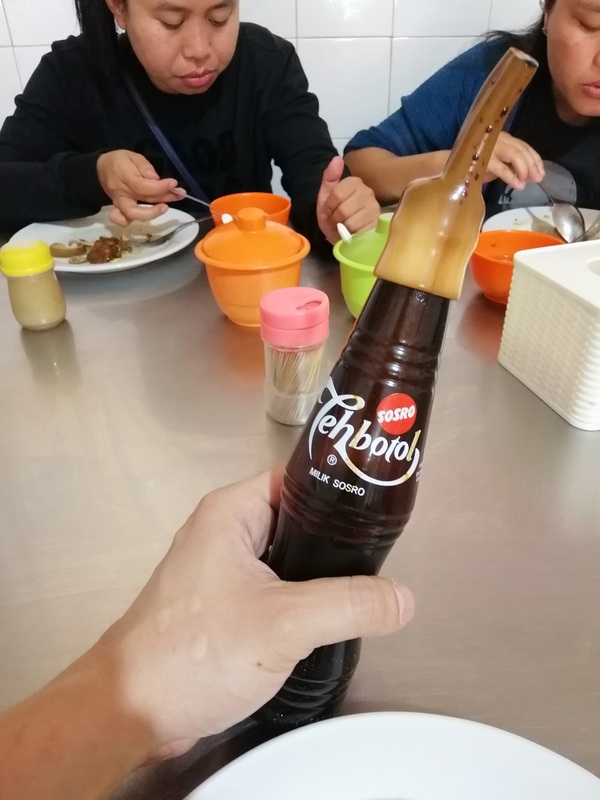 It tastes heavenly! This loaf was too much for me to finish so I had to eat it over two sessions – for supper and as a snack the next day. I really enjoyed the flavors here. It’s rich, sweet and savory at the same time! The bread remains ultra soft even the next day. 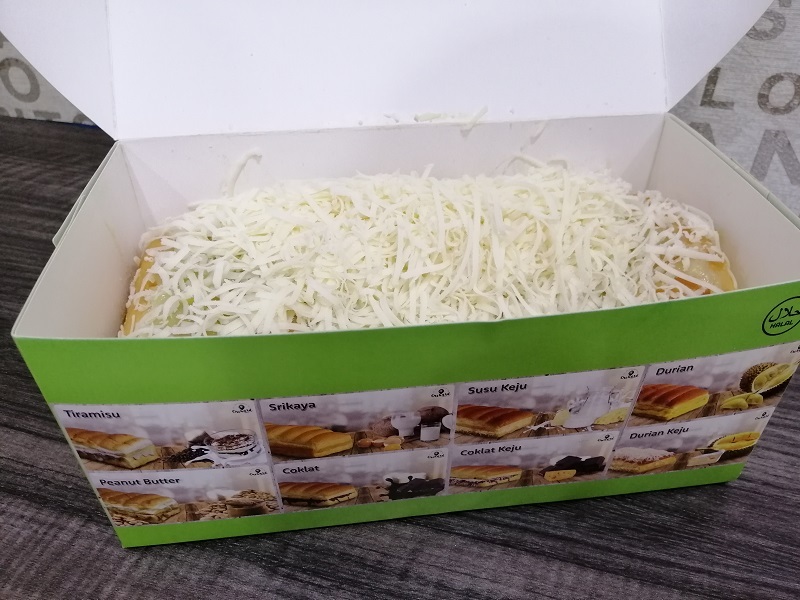 32,000 IDR (RM 9.50) for the durian cheese loaf. 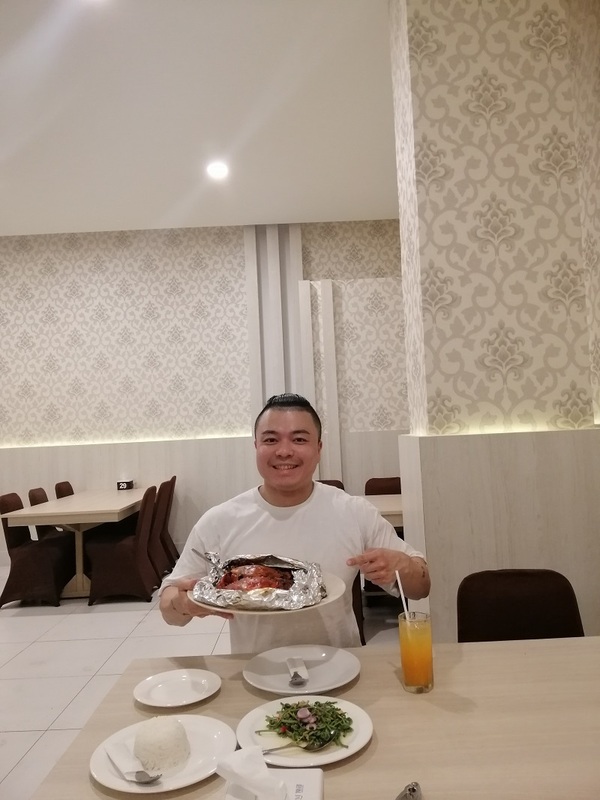 This was my last savory meal before leaving Pontianak. 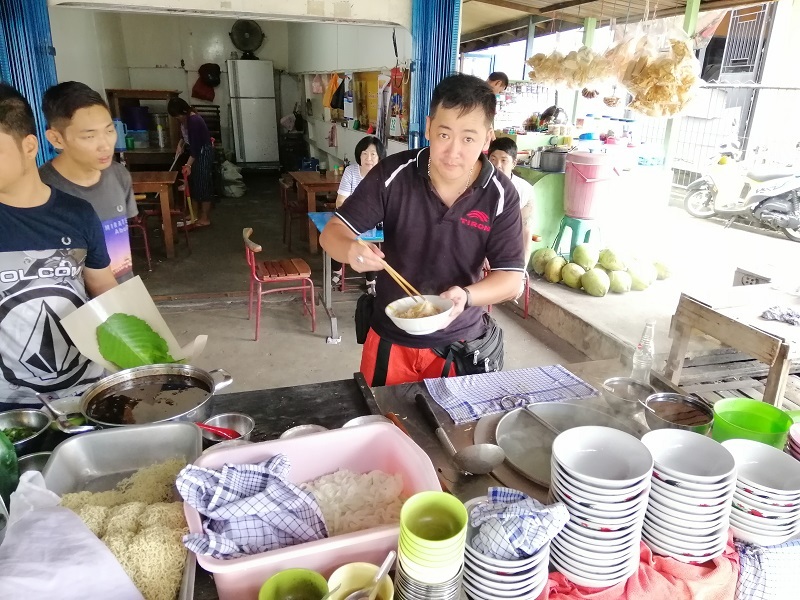 My flight to KL was at noon so I woke up early to have fish porridge at Ahian. 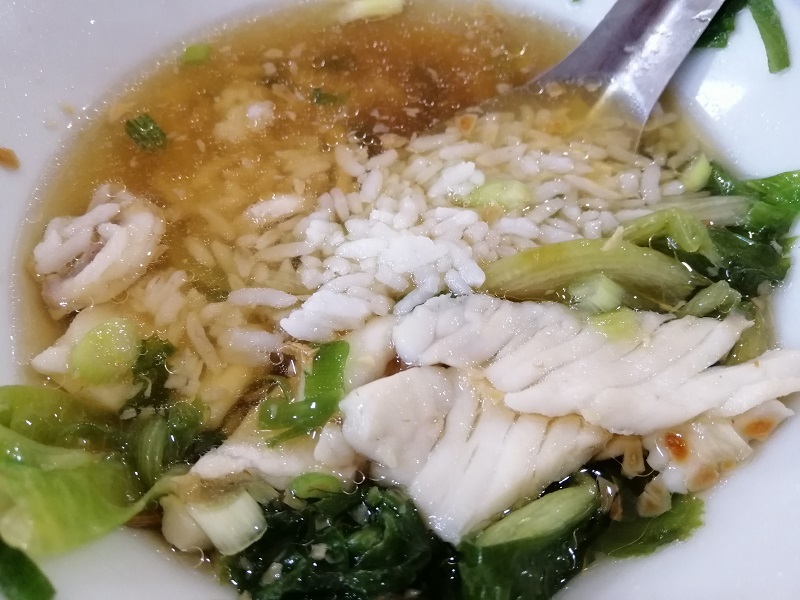 This isn’t really porridge/congee per se but fish soup served with rice. 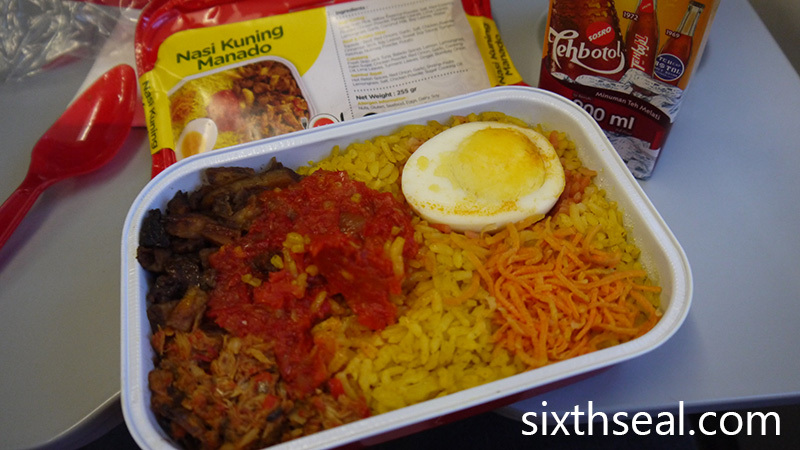 You can also opt to have the rice dunked into the soup, which they call “porridge”. 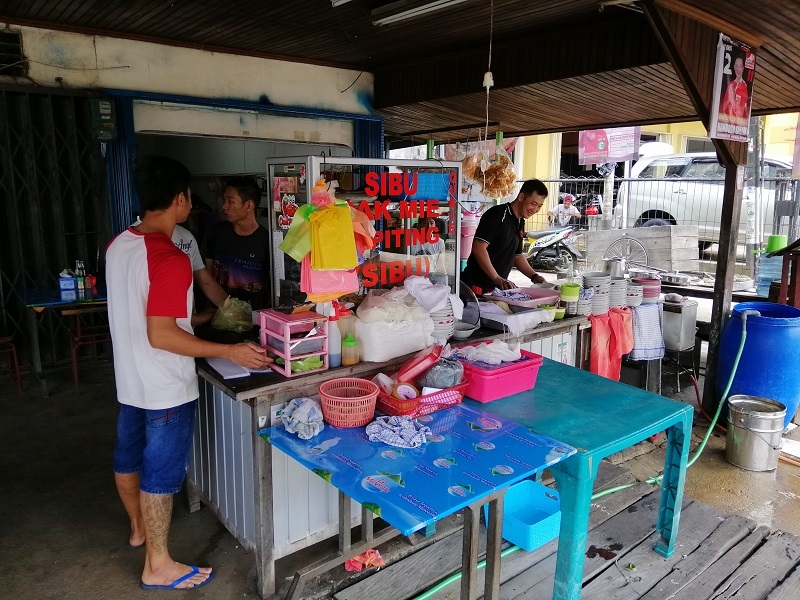 The front part of the restaurant is taken over by a fish processing station. 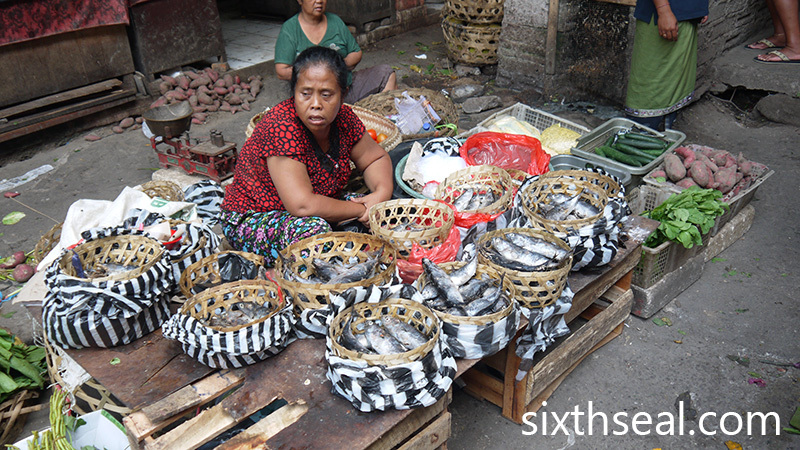 Different types of fish are brought here to be broken down into slices and bones for cooking soup. 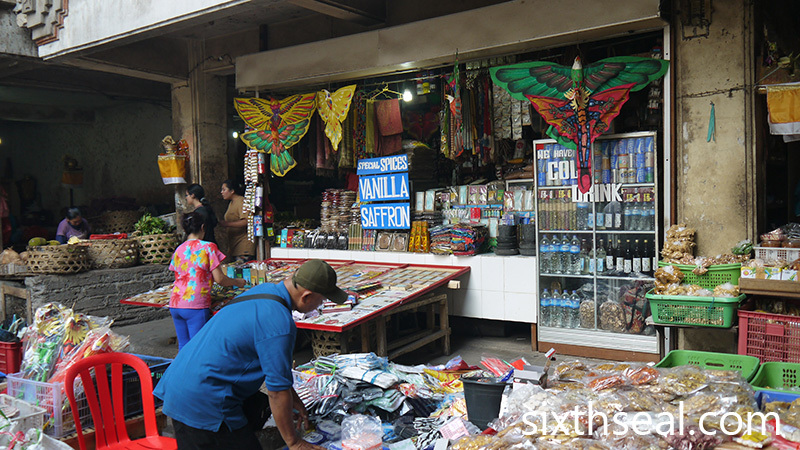 They have a selection of different types of fishes at differing price points. I opted for a mixture of all the fishes for 55,000 IDR (RM 16). It’s a little steep for local standards but a steal in Malaysia. The fish slices were all very fresh! I loved the flavourful soup too. I don’t normally like soup but I enjoyed the strong flavors and sesame oil here. The soup is very different from the bland soup we get locally. This is savory and packed with taste! It goes so well with rice. You can mix the remainder of your rice into the soup for the porridge style too! 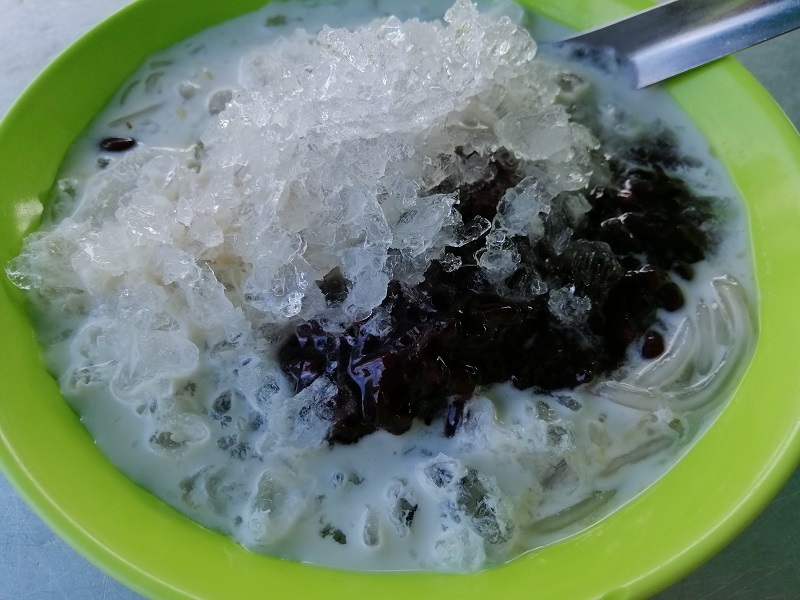 Che Hun Tiau is a local shaved ice dessert. 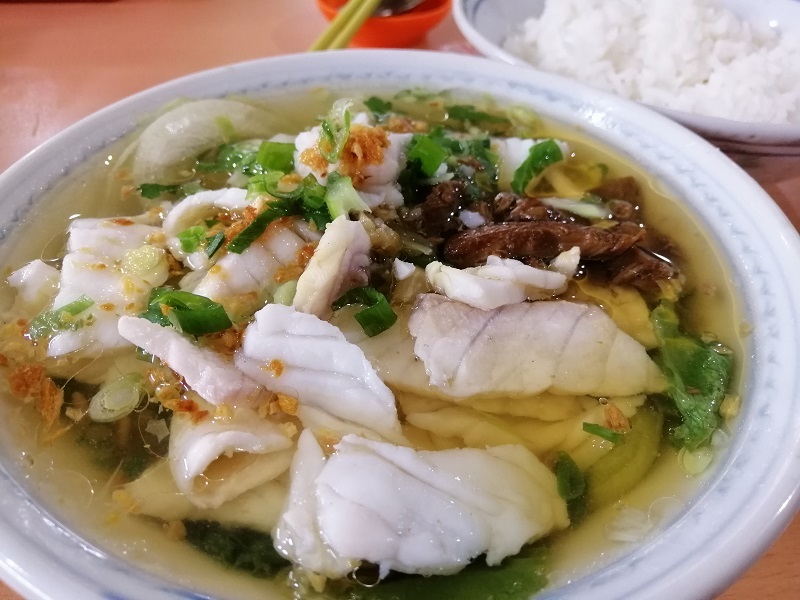 The famous one is called Ahua and located a stone’s throw away from Ahian fish porridge. Unfortunately, it was still closed when I went, although it opened 30 minutes later when I was leaving to return to my hotel). 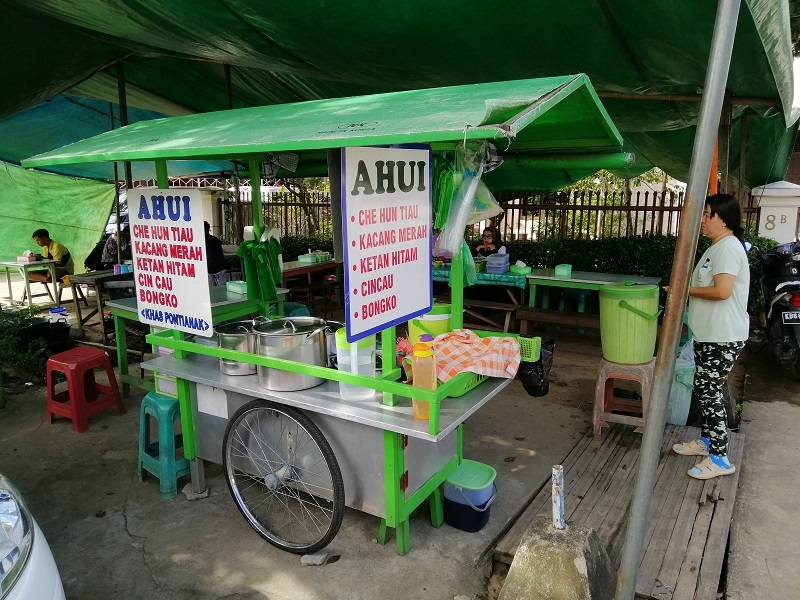 There are several other che hun tiau carts in that area so I picked one at random. 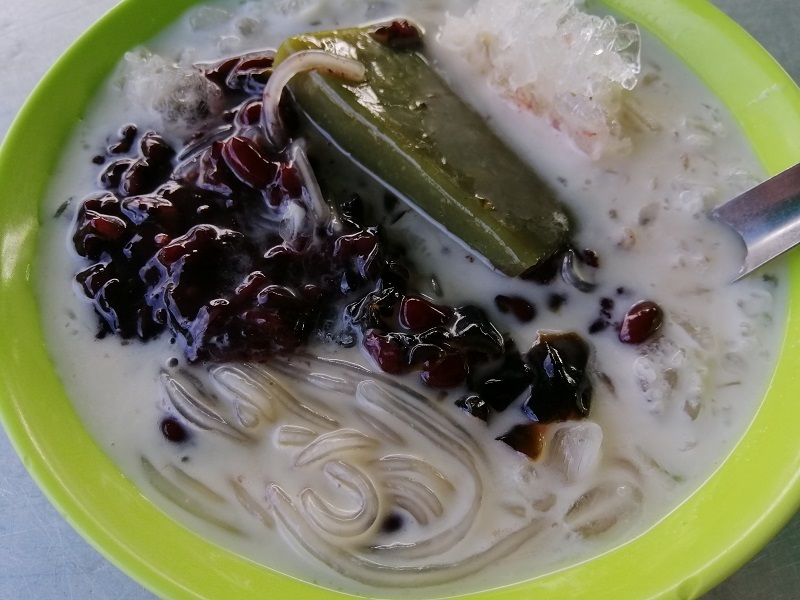 Ice is shaved on top of various items like red bean, a gelatinous mass of jelly, and my favorite – slippery strands of transparent noodles. Here’s a closer look. I really enjoy the mouthfeel of the noodle things. This cost just 6,000 IDR (RM 1.75). 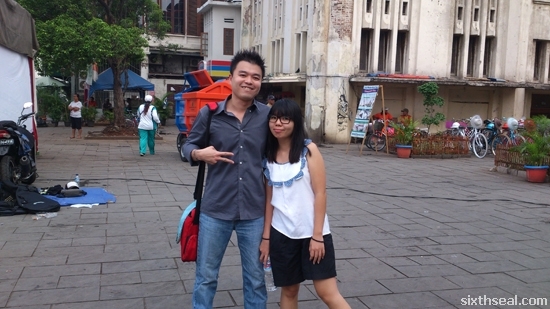 I had a fun 3D/2N trip to Pontianak. This was my first time here but I’ll be back for more eating adventures in the Kalimantan region! I like these remote semi-developed areas. I find them relaxing and unpretentious. It’ll be nice to head to a more rural area next time. I wanted to try Nasi Ayam Afu but they were closed for renovations. 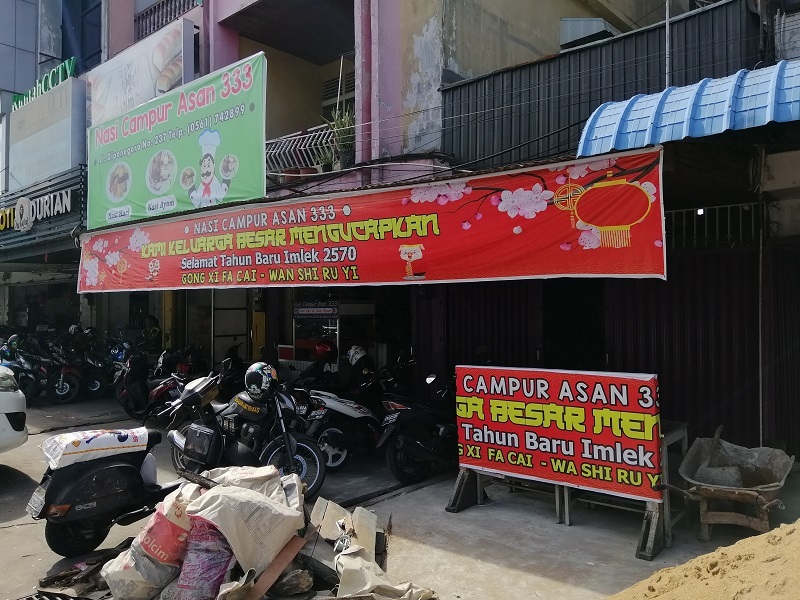 Nasi Ayam Asan 333 Pontianak was my second choice – they’re just a 6-minute walk away. 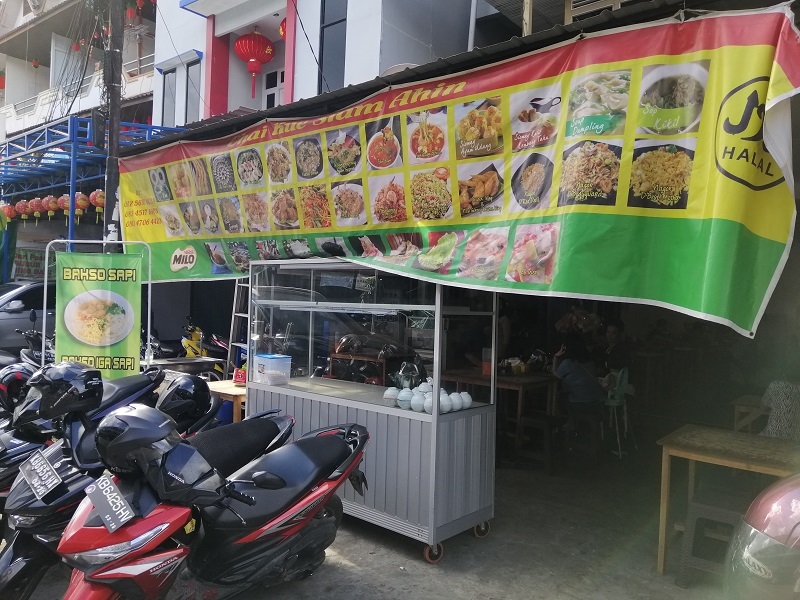 The owner here is Indonesian Chinese and she told me they have an air-conditioned outlet just beside, which might me more comfortable. She pegged me as a non-local instantly. I chose to sit here though coz I thought I’ll be really fast. The seating is via long rows of shared cafeteria-type tables. 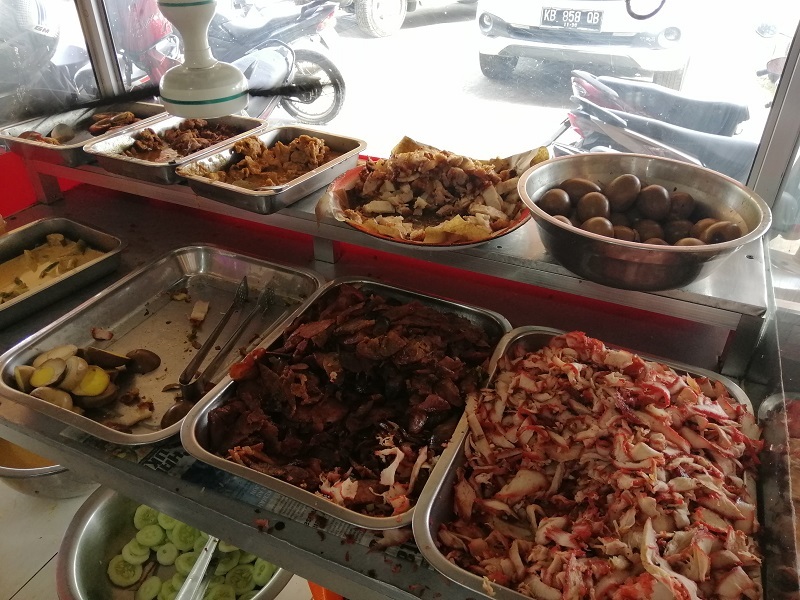 This is what “nasi ayam” in Pontianak looks like. 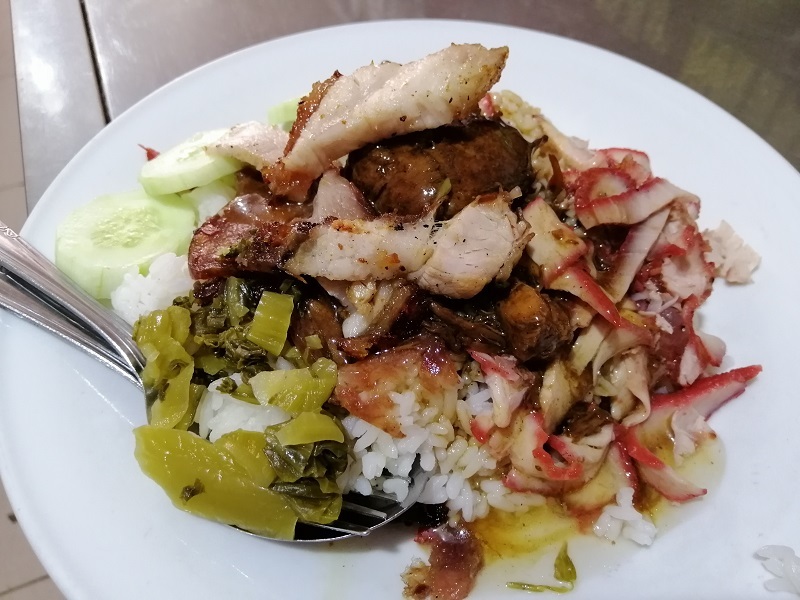 It’s a selection of many different meats – Indonesian Chinese style char siu, siu yoke, pork sausage, and chopped up roast chicken. Everything looks familiar, yet slightly off, like a strange alternate universe. The sauce is THICK and flavorful and there’s bits of pickled vegetable to cut the strong flavors. I really like it! It’s different from local Chinese chicken rice in Malaysia. It’s 33,000 IDR (RM 9.50) for this plate. This is a sprawling coffee shop with two outlets located opposite each other. 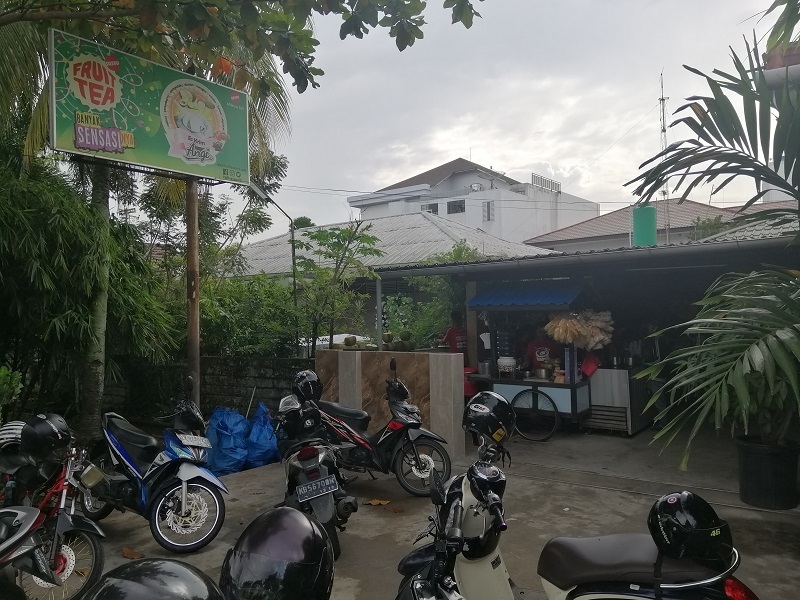 Locals come here to smoke, play games, hang out and drink coffee. Just look at how packed it is! 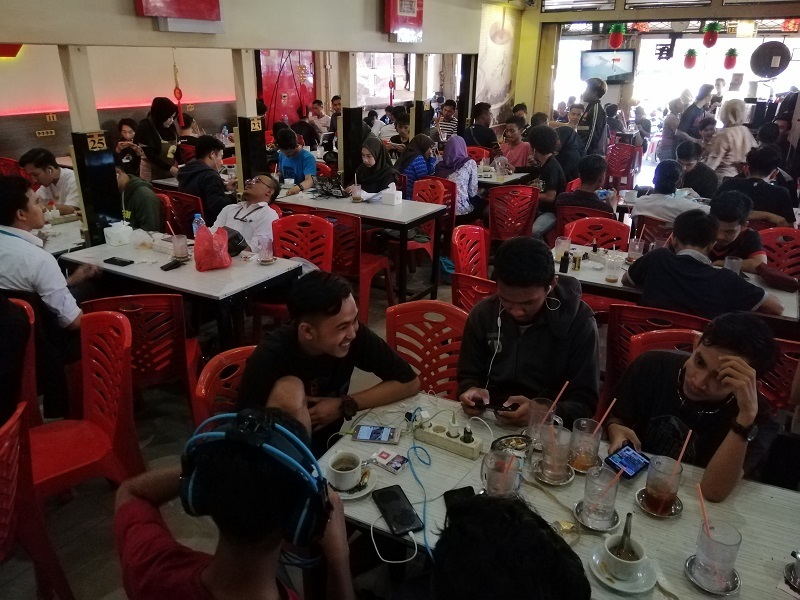 Pontianak is majority Muslim so alcohol isn’t a common form of socializing. Instead, they drink coffee – even late at night! It’s so busy here even during a weekday off-peak afternoon. 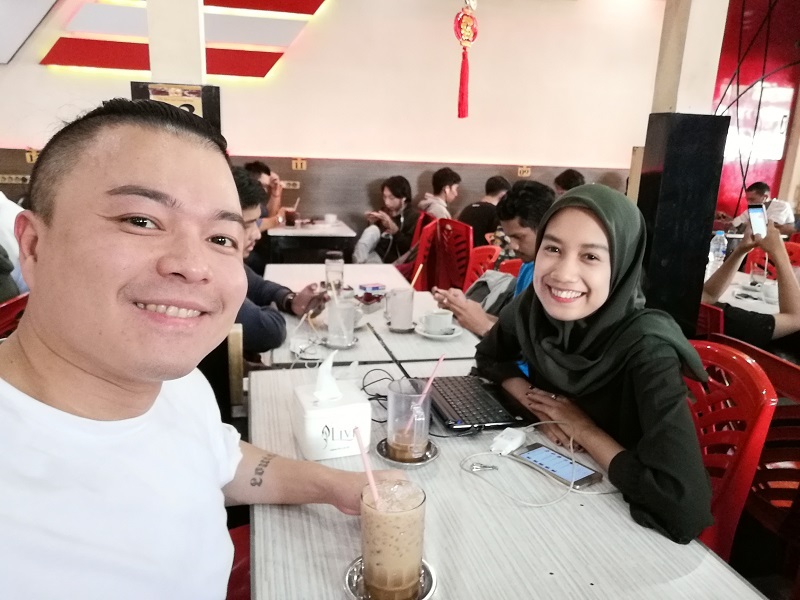 Every single table was occupied and I had to share one with a local Muslim girl. She turned out to be a university student and was on her laptop doing some slides. 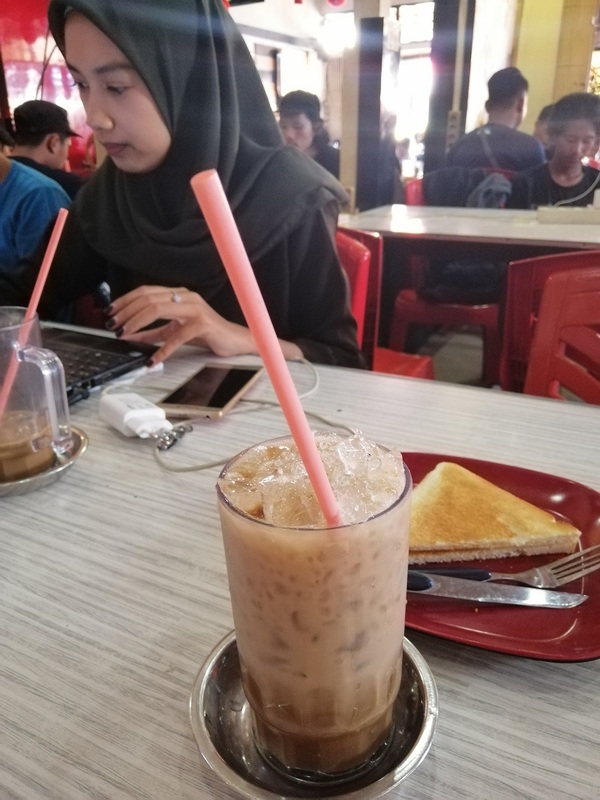 I ordered an iced coffee and a Milo toast (basically Milo powder and condensed milk inside one slice of toasted bread folded together). 16,000 IDR or RM 4.70. This is a shack located around the corner from Aming Coffee. 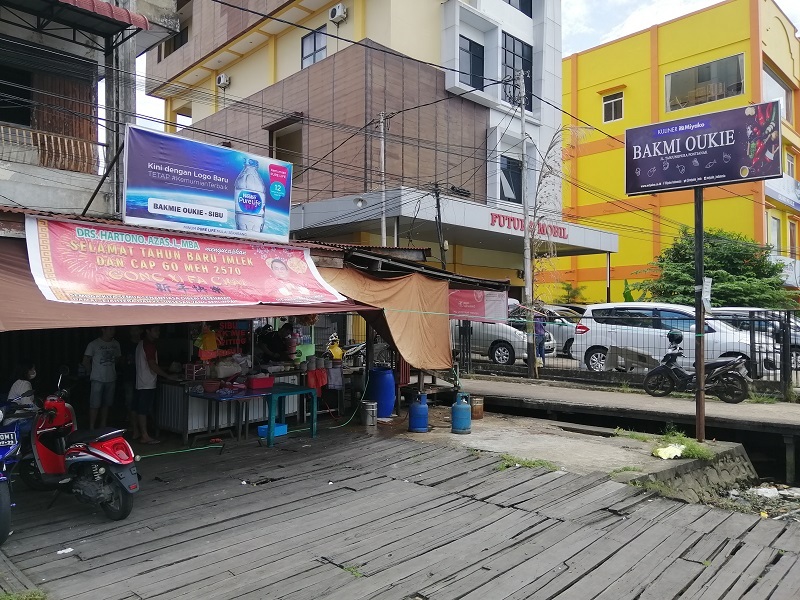 Most places in Pontianak town are within walking distance of each other, if you don’t mind walking up to 10 minutes under the hot sun. Gojek is available for little more than ringgits for a short ride, which I took advantage of more than a few times. 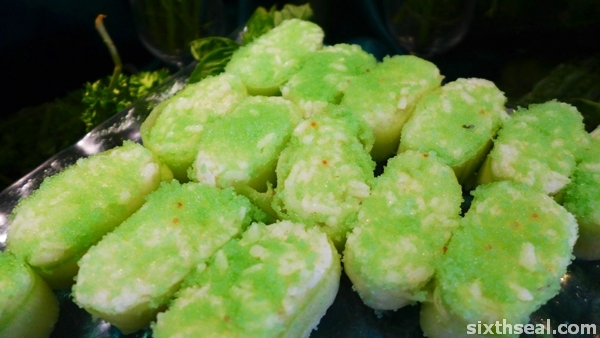 This is the Indonesian take on chai kueh – a vegetable stuffed kueh. 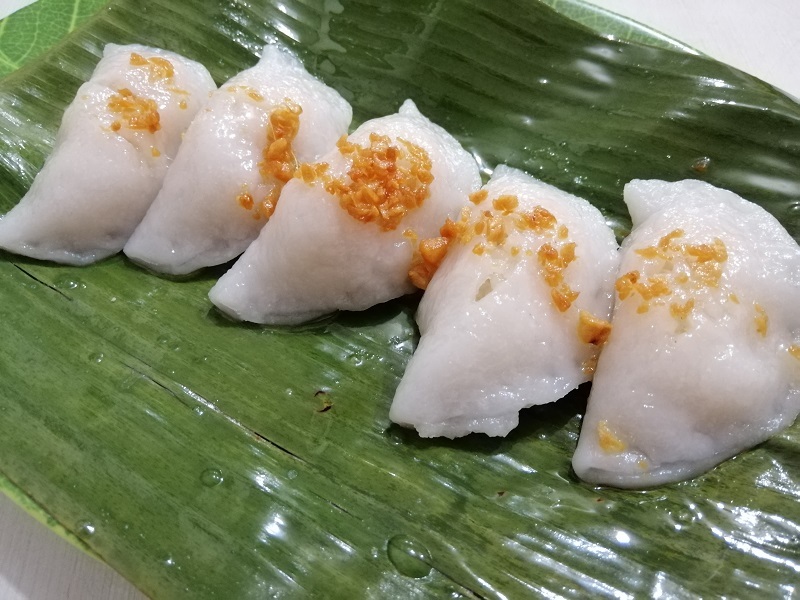 The Pontianak version is very, very oily though – they literally brush each kueh and the banana leaf it is steamed on with cooking oil! Minimum order is 5 pieces and I struggled to finish it due to the oiliness. I like how they’re steamed to order though. 7,500 IDR (RM 2.20). The best smoked crab ever! This is the first time I’ve had smoked crab and the intense smoky rendang flavors are awesome! It’s so delicious, I felt it deserved its own blog post. 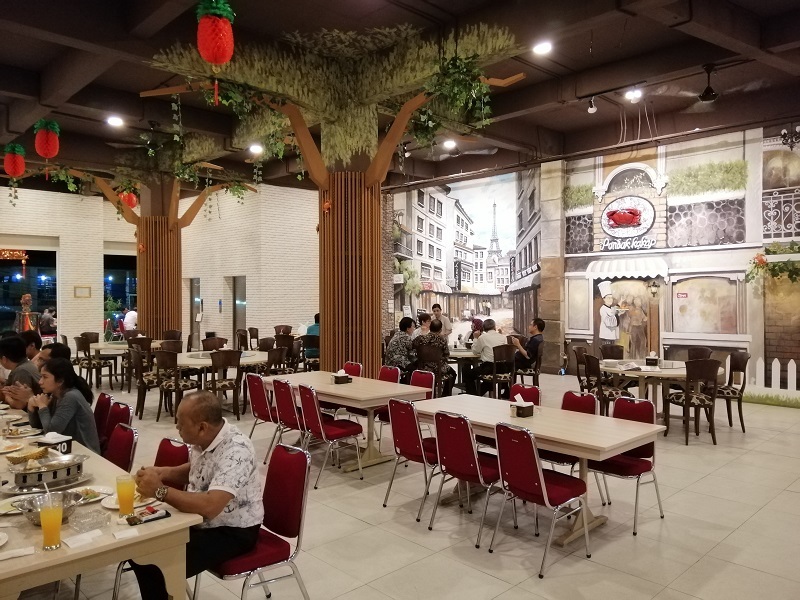 Read my review of Pondok Kakap in Pontianak here. It’s a bit expensive compared to the others but definitely worth the price. 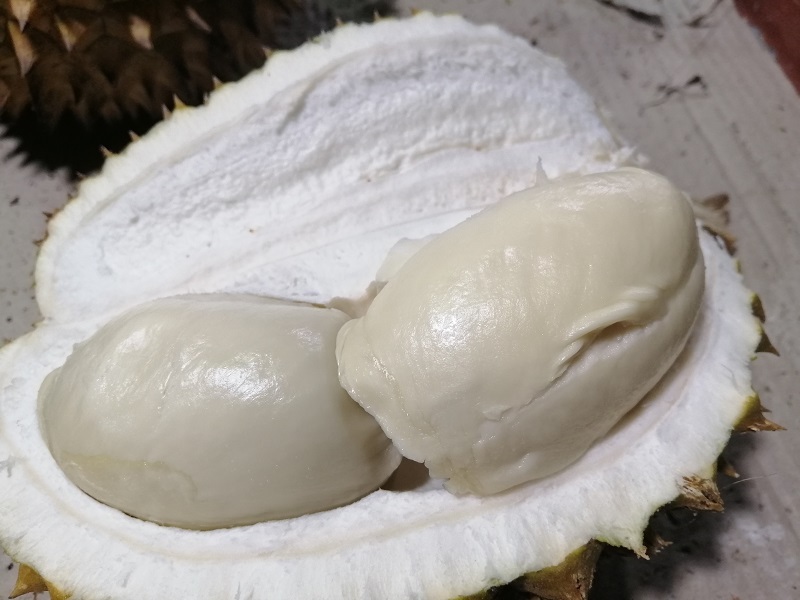 This is a durian hailing from Sungai Jawi. I gather it’s a popular breed here. 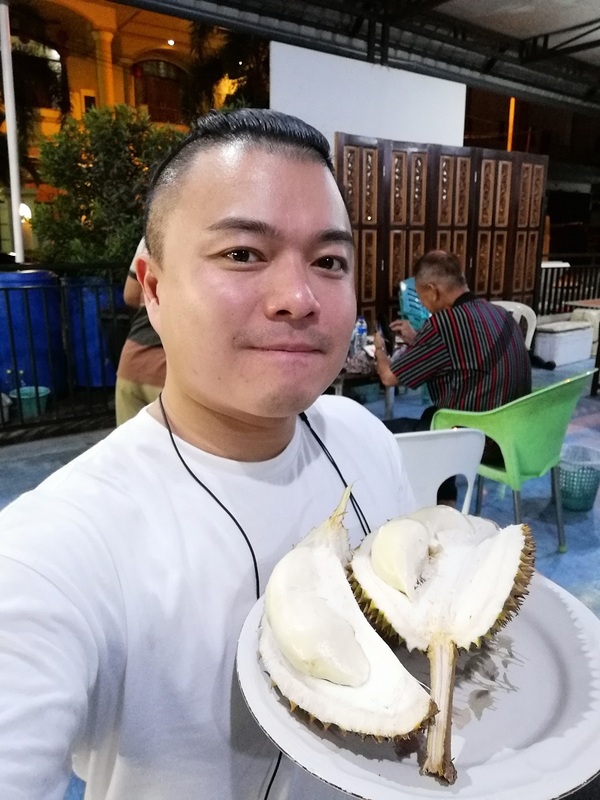 I paid 60,000 IDR (RM 18) for a small durian with only 5 seeds. 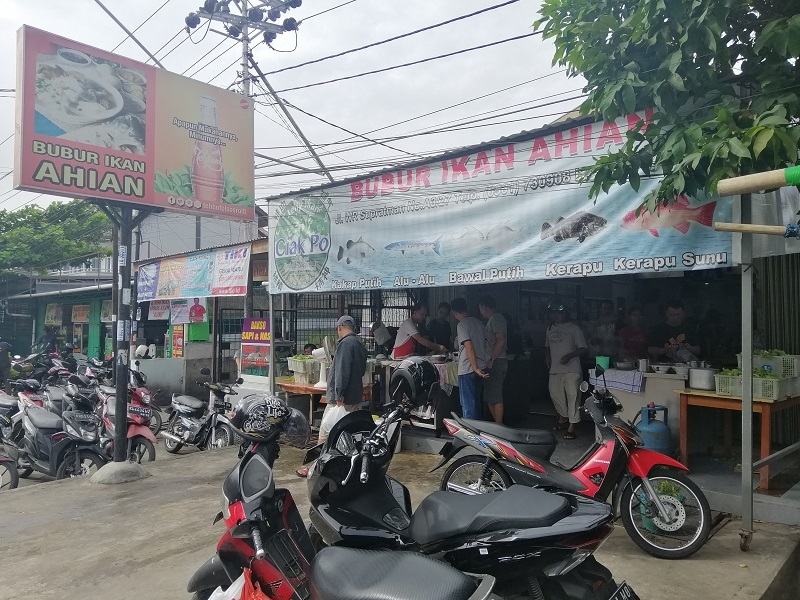 This is likely coz I found the durian stall outside Pondok Kakap – a high end seafood restaurant, among the best in Pontianak. I later saw durians of the same breed being sold for 5,000-15,000 IDR (RM 1.50 – RM 4.50) elsewhere. Taste wise it was decent, although a little less ripe that most Malaysians would prefer. 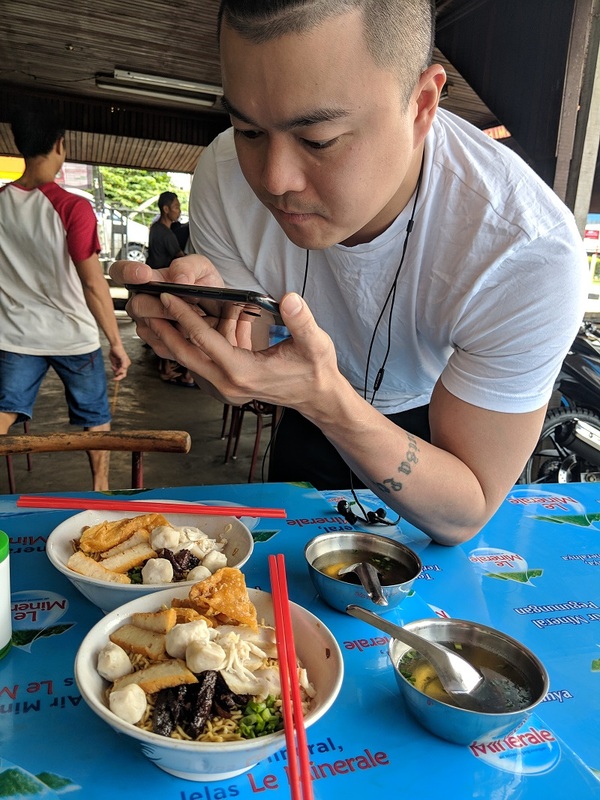 This was the only touristy thing I did in Pontianak. 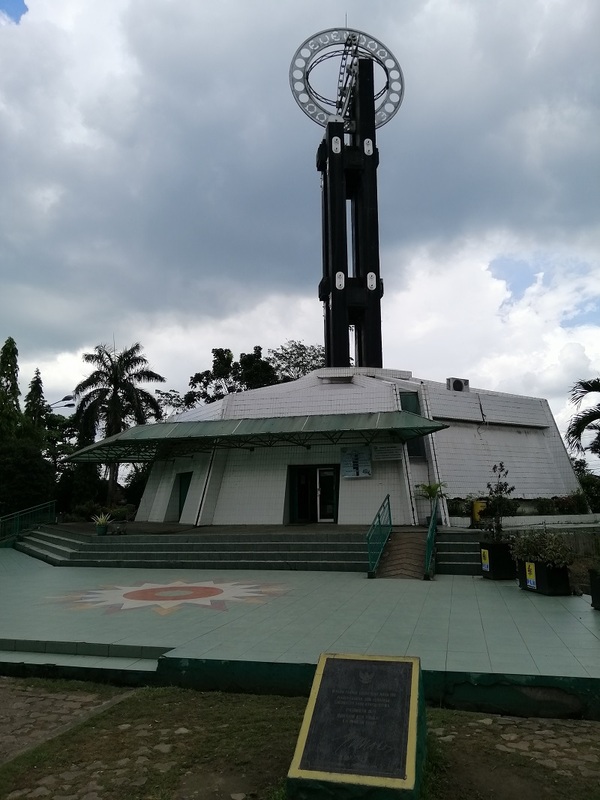 I heard Pontianak is the only city in the world to sit along the equator line so I thought I’ll go visit the Equator Monument. 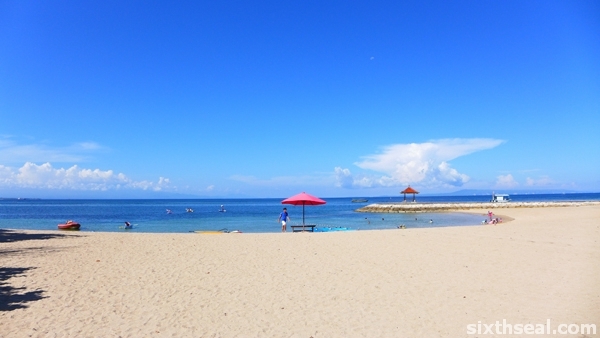 This monument slash park is located 30 minutes from town – a 64,000 IDR (RM 19) Gojek ride away. It’s supposed to be a place of interest but the park is so run down and ill-maintained that I do not think a visit is warranted. It looks like a forgotten and deserted government-run attraction that time forgot. There’s a sleepy security guard but all the F&B stalls and kiosks were closed, probably due to lack of business. There’s no entry fee but there’s nothing much to see here either. 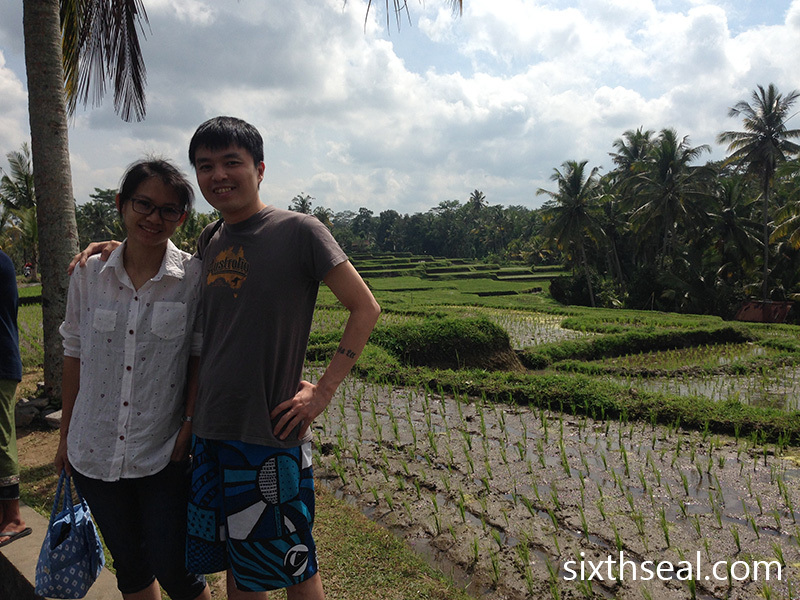 I found 2 other souls there – a couple from Surabaya. Including the security guard and the old makcik running the dusty and sad souvenir shop, only 5 people were present at the park. It was disappointing. 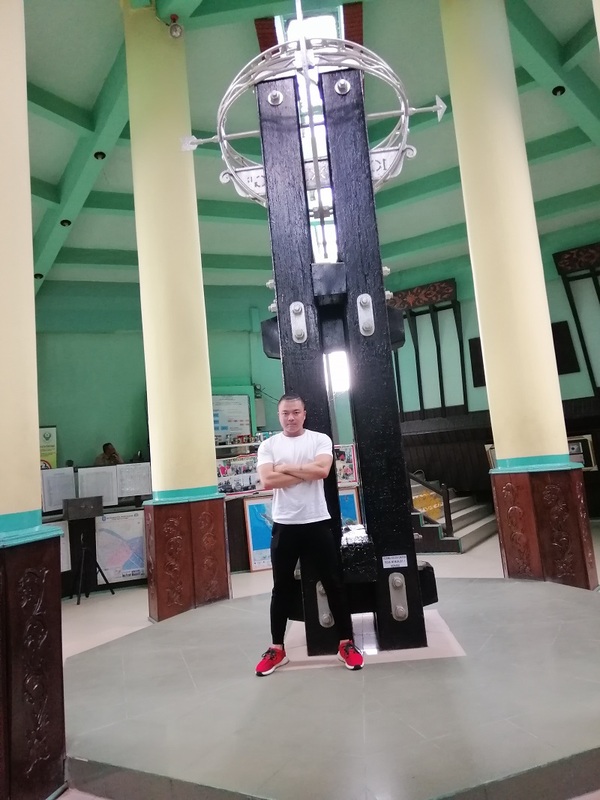 There’s not much to see or do, and I would recommend you skip this place unless you really want a photo with the equator monument. 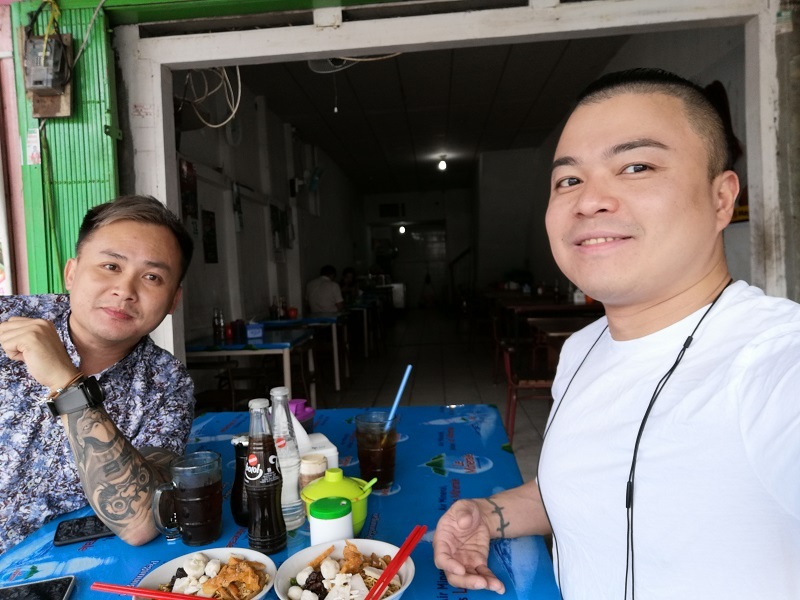 Part II of my Pontianak trip coming soon! We were looking for something local to eat and happened to chance across Bebek Bengil in Google Maps. 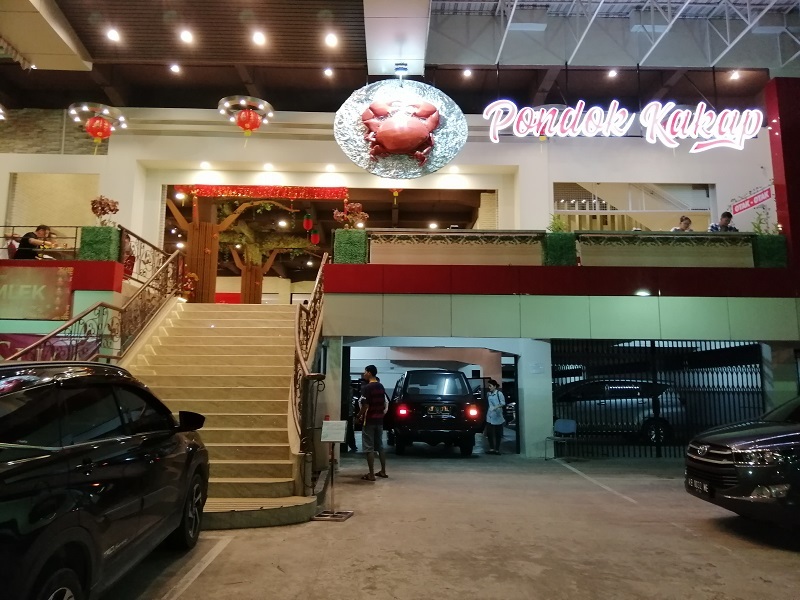 It actually took us more than 30 minutes to walk over but I thought it was worth it since it’s touted as “The Original Crispy Duck Since 1990”. 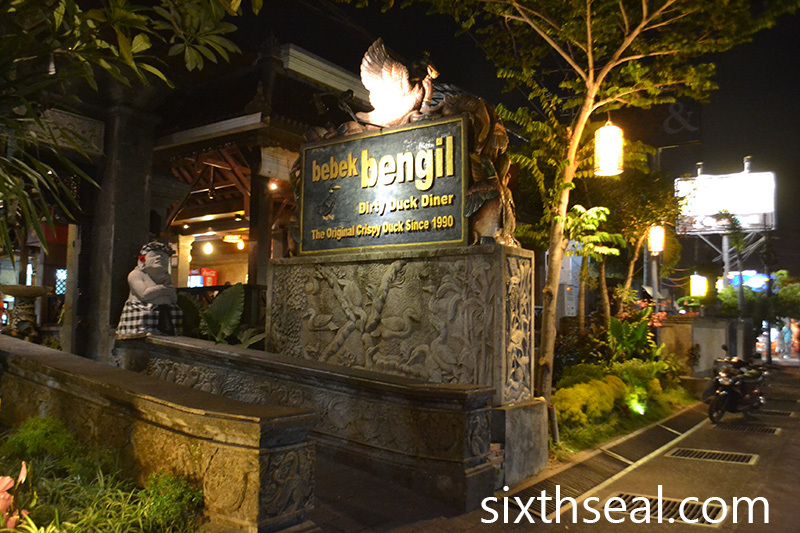 Bebek Bengil Dirty Duck Diner is known for their crispy grilled duck. 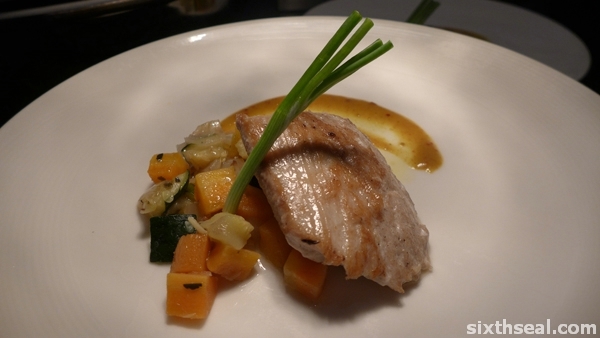 This is a different dish from the popular bebek betutu in Bali. 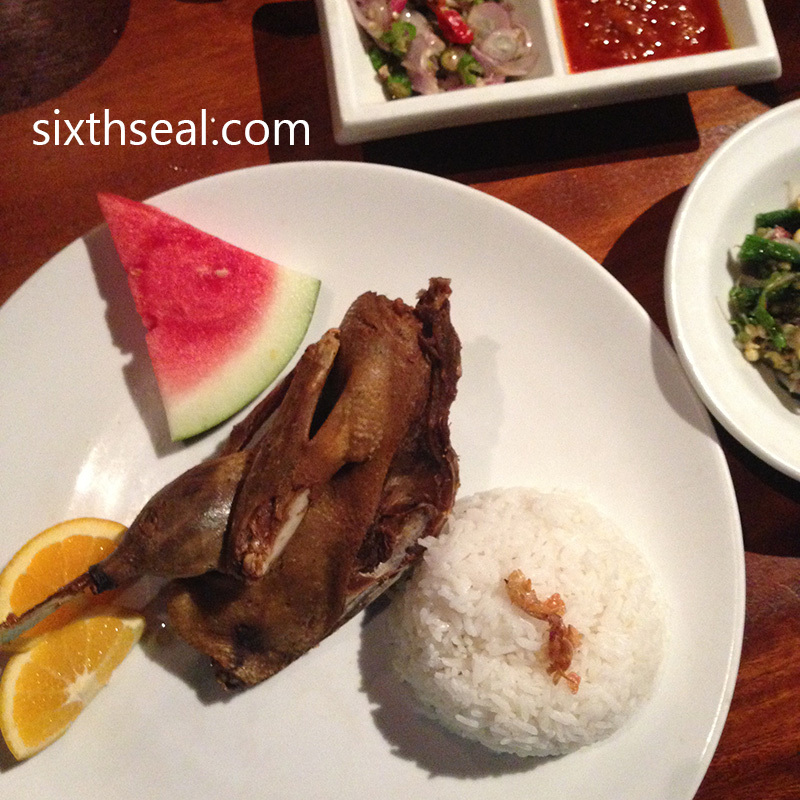 Bebek Betutu is a seasoned steamed or roasted duck that’s popular in Bali. Bebek Bengil (which means dirty duck) serves crispy duck. 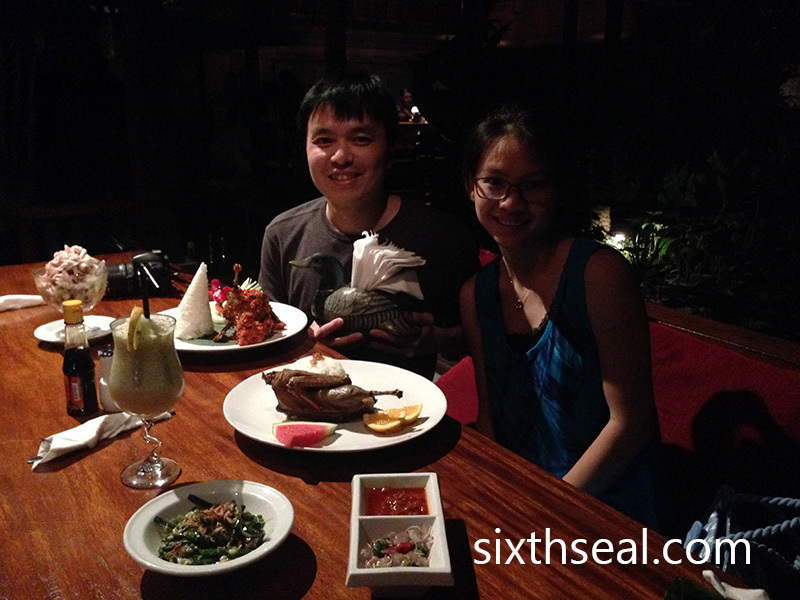 You can even order 1 whole duck for IDR 300,000 if you book one day in advance. It’s a pretty good deal at RM 94/duck if you want to go for it. 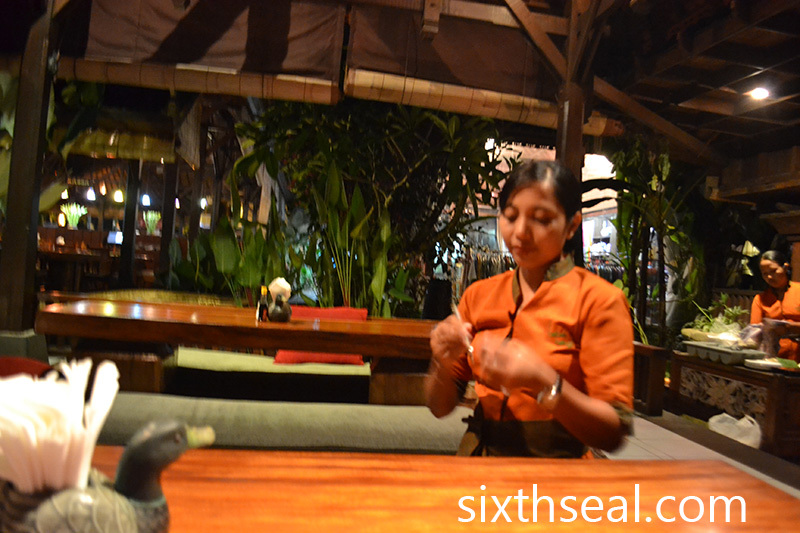 The service by the uniform clad waitresses is pleasantly discreet and unobstructive. 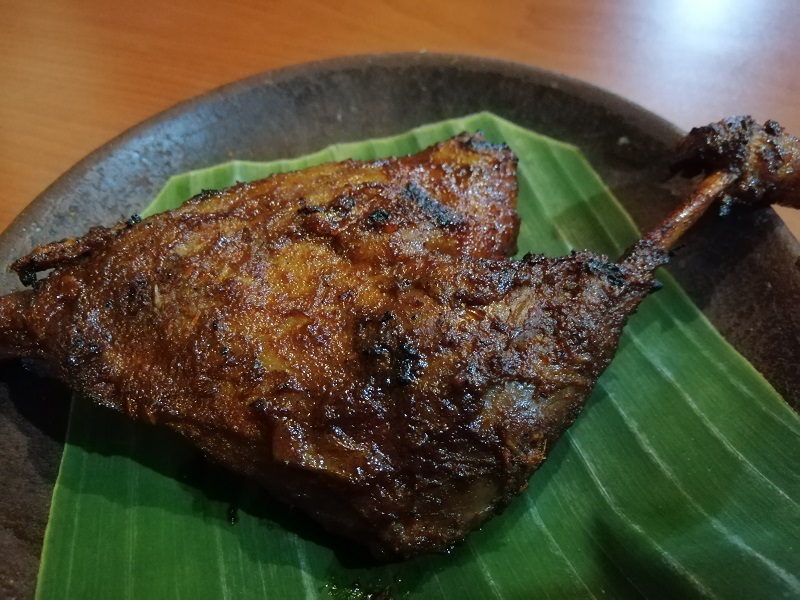 I had this original dish, which is half a duck steamed in Indonesian spices which is then deep fried for a crispy finish. 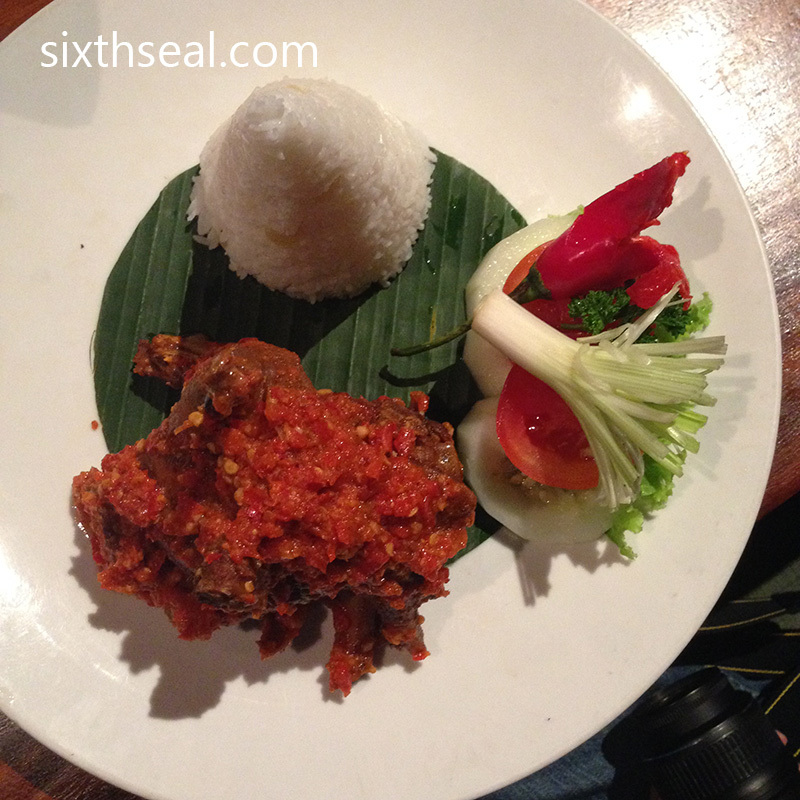 It’s served with rice and Balinese vegetables and it cost RM 40. It’s their flagship signature dish and it tasted alright. I’m not a huge fan of deep fried duck and I thought it was slightly too crispy but personal tastes aside, it was pretty good. 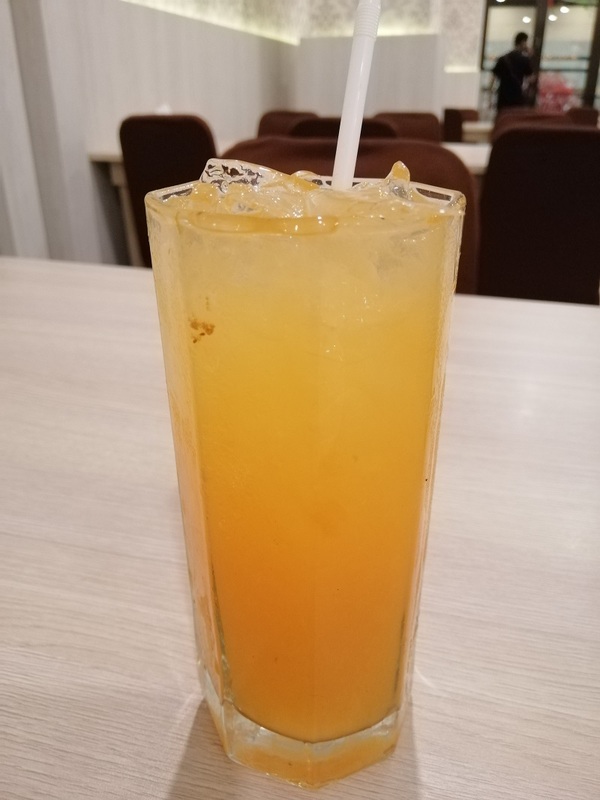 This is what my better half had – it’s a concoction of pure orange, markisa (passionfruit in the local language) and melon sugar. 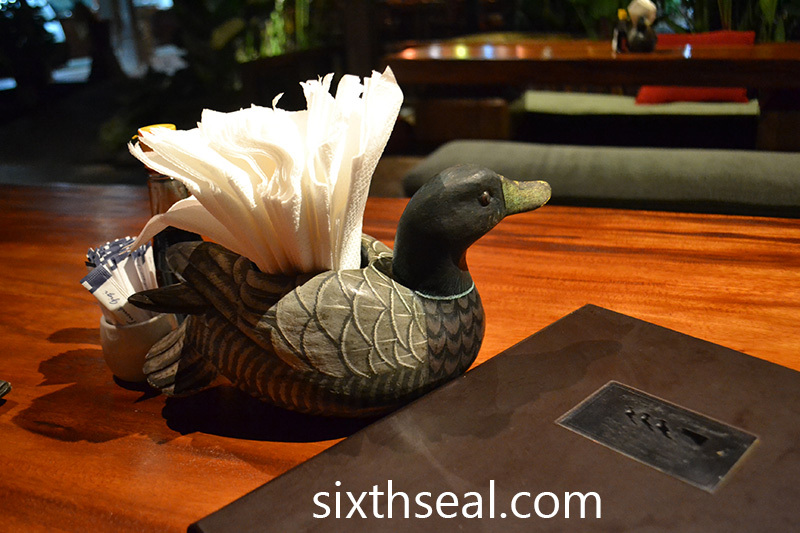 The drink I had was chosen at random from the duck-themed options. It turns out to be a shaved ice confection with lots of interesting goodies at the bottom – love the white squiggles and fresh fruit slices. My dear ordered this dish. 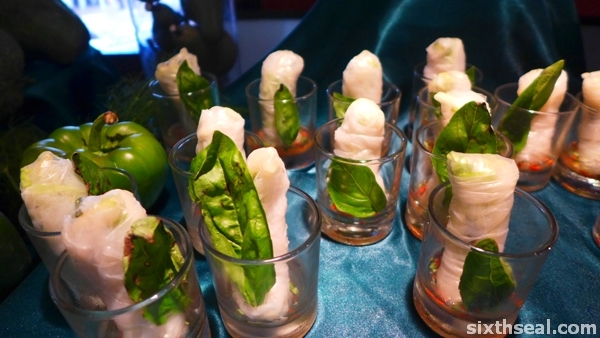 It’s one of the specialties and the Balinese recipe came from one Ibu Agung Raka Sueni. I have no idea who that is but the owners of Bebek Bengil thought it was noteworthy enough to highlight this in their menu. This is the grilled version of the duck (as opposed to my steamed and deep fried duck) with Balinese sauce and steamed rice. It’s very spicy! I really like the sauce here. I thought the ambience of Bebek Bengil is unique – the place is totally dark (as you can probably gather from the photos) with the exception of mood lighting from the pavilions where we were seated. There were not a lot of people due to the higher than usual prices. The meal came up to around RM 140 for the two of us and it’s worth a visit for the atmosphere alone. 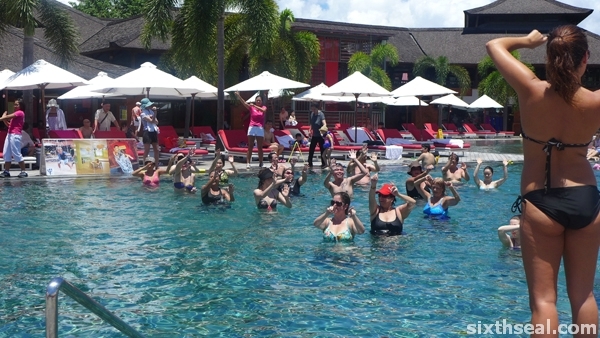 The water features around the raised dining pavilions made it really romantic. 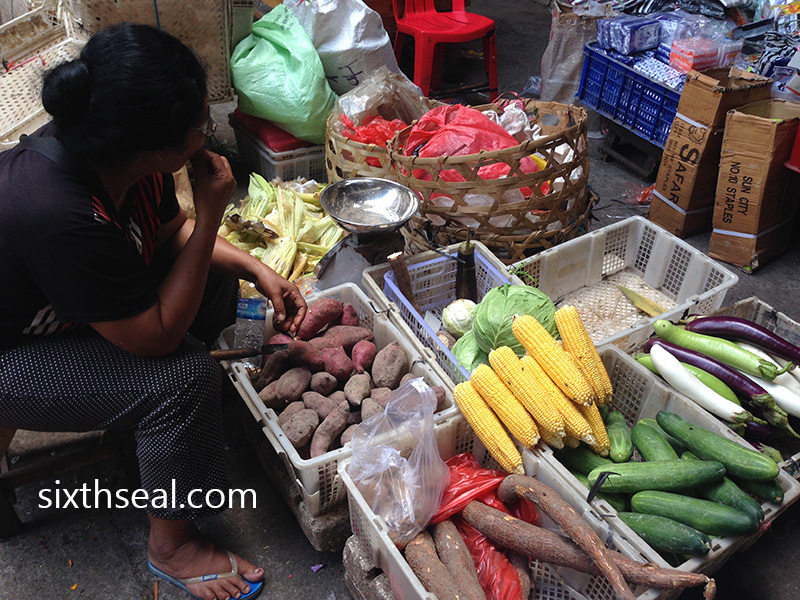 We went to Ubud Morning Market as part of our cooking class. 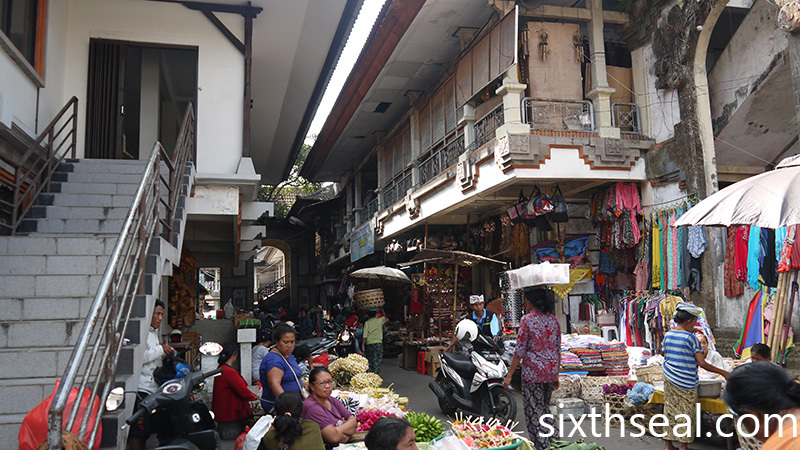 There are actually two markets in Ubud, both interconnected. 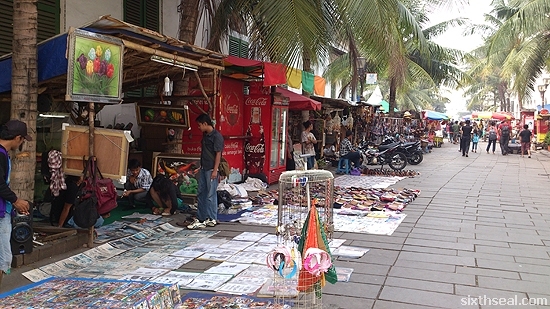 The Ubud Morning Market is where the locals go while the Ubud Traditional Art Market is a more tourist oriented market. 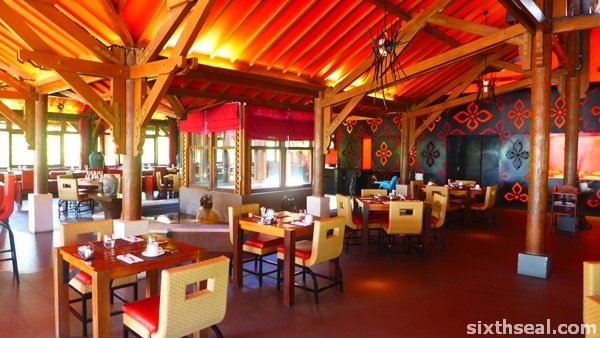 The latter was featured in Eat Pray Love and is known locally as Pasar Seni Ubud. 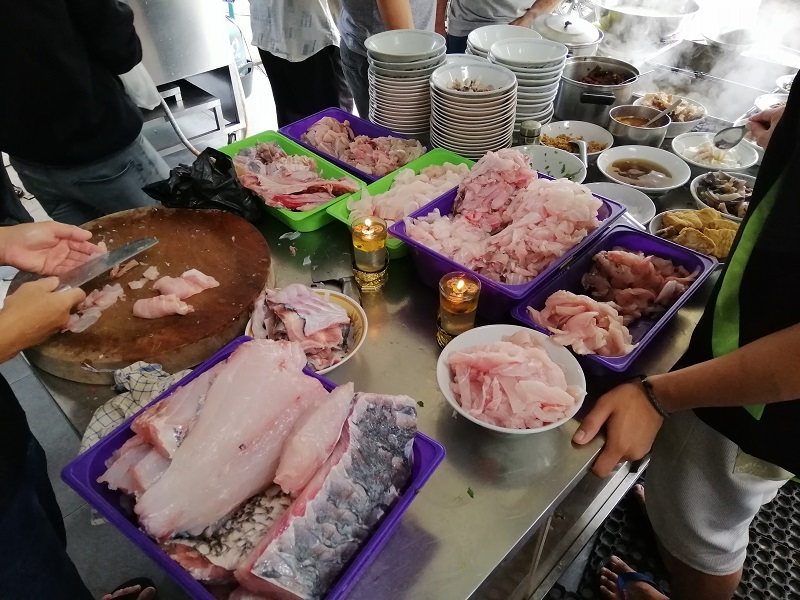 I thought that going for a Balinese cooking lesson was a cool thing to do while on vacation, although I can’t claim credit for it. My better half was the one who thought of it and booked us the classes. The van picked us up in the morning and we went to the Ubud Morning Market for a tour of the place and to sample some local produce as well. …and I thought it was very refreshing that there was no attempt to sell us on anything (probably coz these are mostly produce). 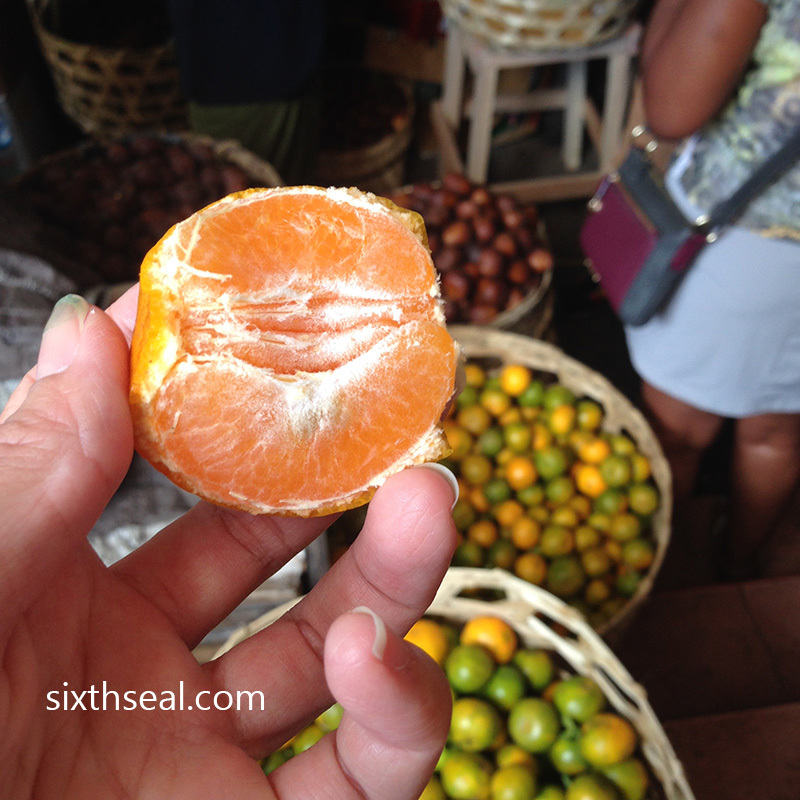 This was described as a “sweet passionfruit” to us and we all got a taste of it. I thought it was a buah salak at first. 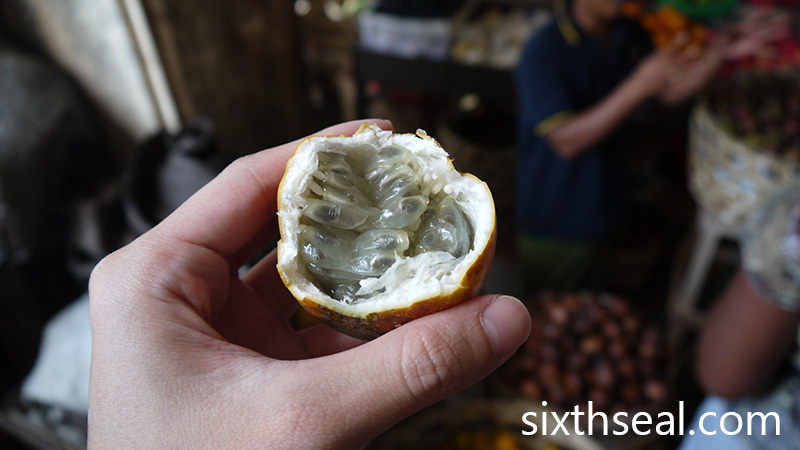 It’s not passionfruit as we know it, this is a South American breed called granadilla. Unlike our purple passionfruit, this is orange and features a seed matrix that looks like kiwano (horned melon). 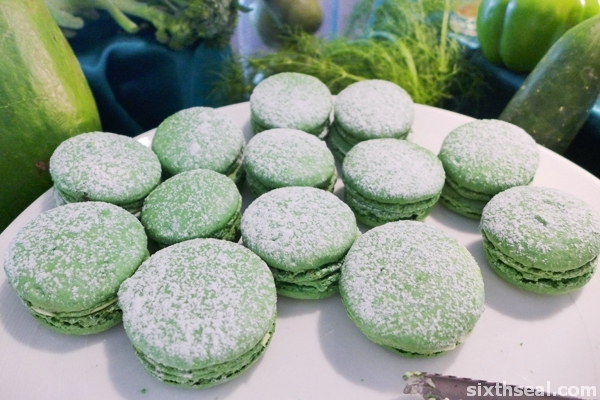 It’s very sweet with no sour notes and nice to eat by itself. The pulp is very tasty. 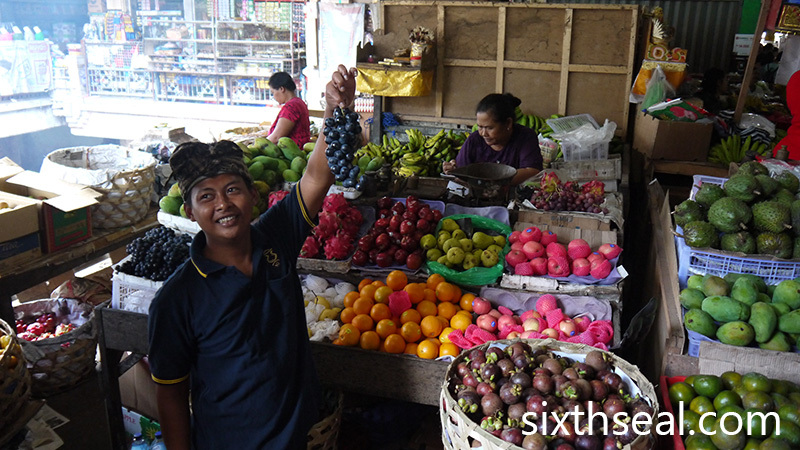 Bali is also able to grow their own grapes now. I tried one of the first batches of Balinese wine made from Balinese grapes in Club Med Bali in 2013 and it was decent, if rather immature. 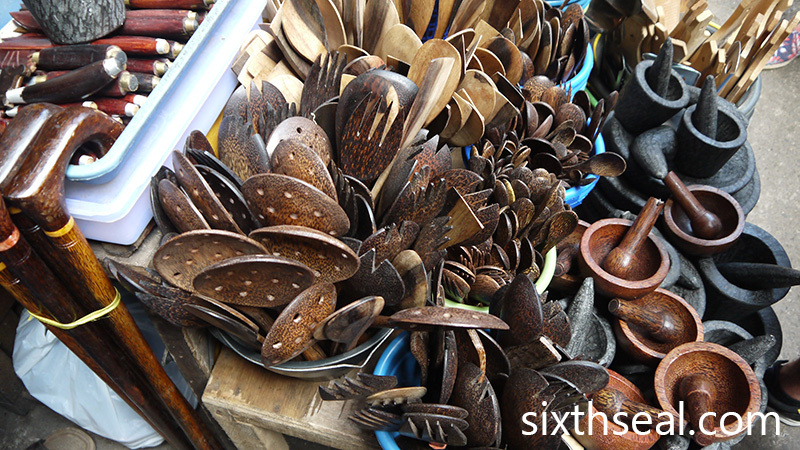 There are also knives and other local goods on display at the Bali Morning Market. 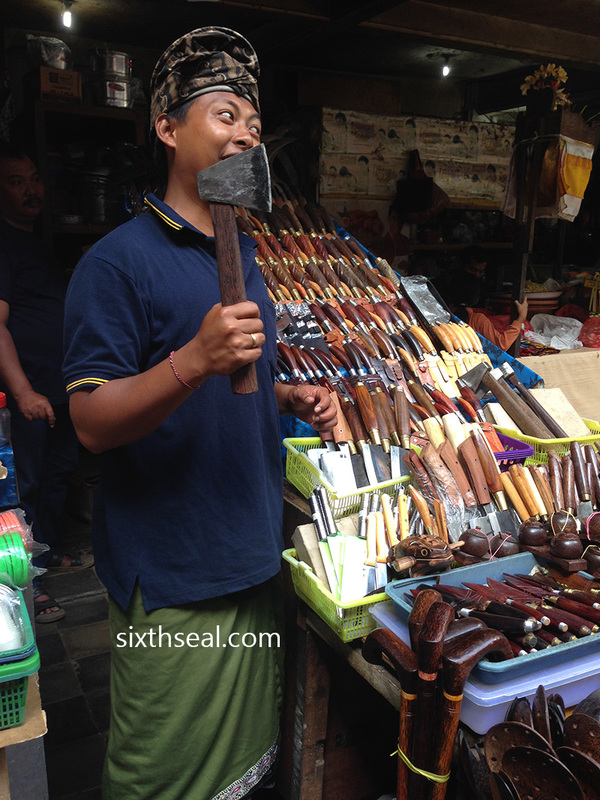 My dear spotted a mortar that she really liked – it’s made out of volcanic rock from Bali! I paid IDR 60,000 (about RM 20) which is quite a good deal. 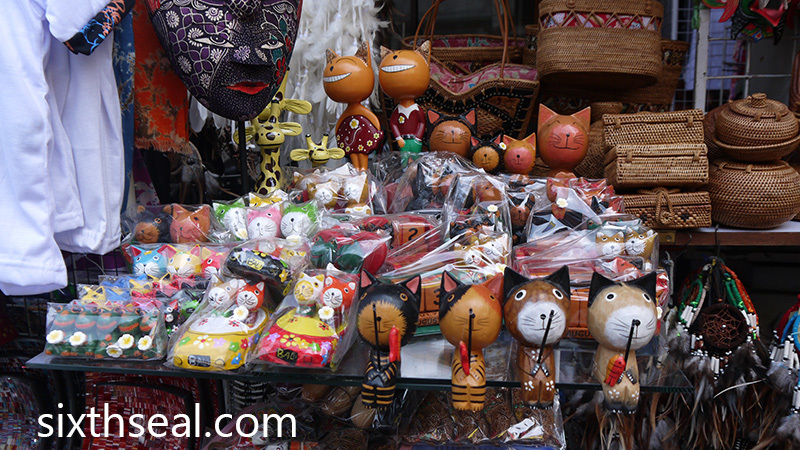 We also walked around the touristy Ubud Traditional Art Market after we finished our cooking lesson. 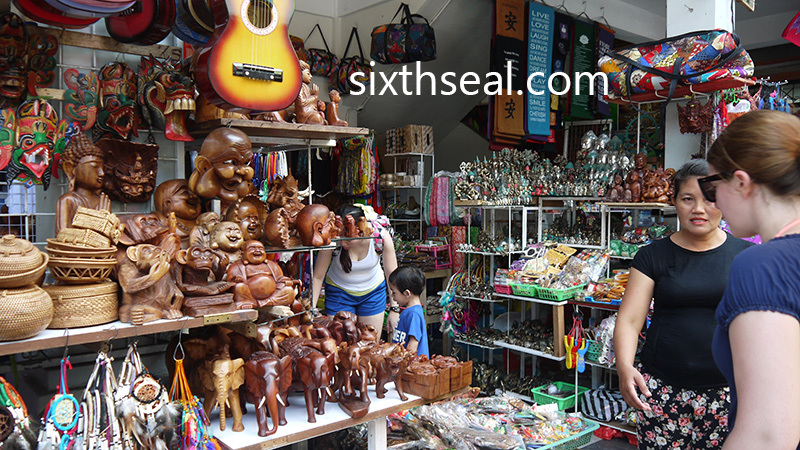 It’s worth a stroll even though you’ll find most of the things here are mass produced souvenir kitsch. My better half also had a theory that if we were carrying a certain color of plastic bag, it means that we were willing to spend more, or rather am susceptible to be conned more easily. Haha! I don’t know how true that is, but I had limited headway while bargaining for a set of three kittens that my dear liked. 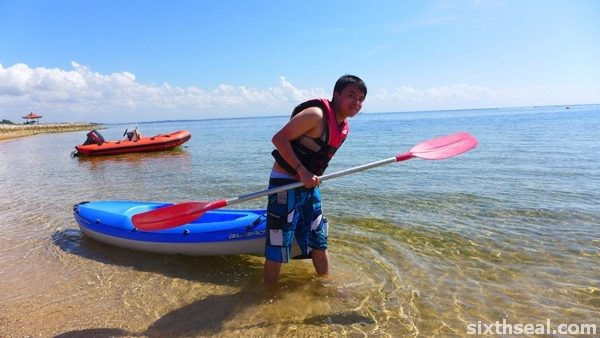 I think we ended up paying RM 80 for it. I don’t think there’s a plastic bag conspiracy though, it seems quite unlikely in the free market everyone-for-themselves nature of the tourist trade, but you never know. This is mostly about the scheduling malfunction. I’m currently sitting in the airport in Bali alone coz of a series of unfortunate events. 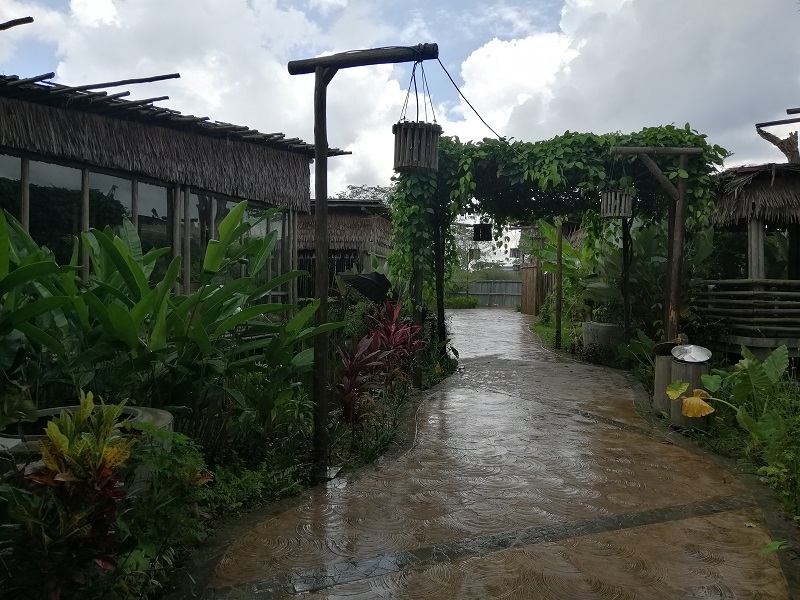 I realized too late that my Taipei trip overlapped with my Bali departure so it was decided that my better half would fly out first and I’ll go join her in Ubud when I came back from Taiwan. I hadn’t realized that the ticket conditions prevented me from taking the return trip if I hadn’t shown up for the departure. Yup, the original ticket was on Malaysia Airlines, not a point-to-point airline like AirAsia or I wouldn’t have this problem. My dear had bought us both tickets to Bali but since I was in Taiwan at the time, I had to buy another ticket from KL to Denpasar (cost me RM 432). I don’t have a problem with this, little did I know that since I was a “no show”, I revoked my rights to travel back on the return leg. I’ve been travelling quite frequently since I was a kid and never ran into problems like this until the downgrading of Malaysia Airlines (in the glory full service days, you could just about do anything). Maybe all you needed was a small rebooking fee, but with the cost saving measures by MAS, it’s now effectively a low-cost airline with restrictions. It’s definitely not a premium airline anymore. 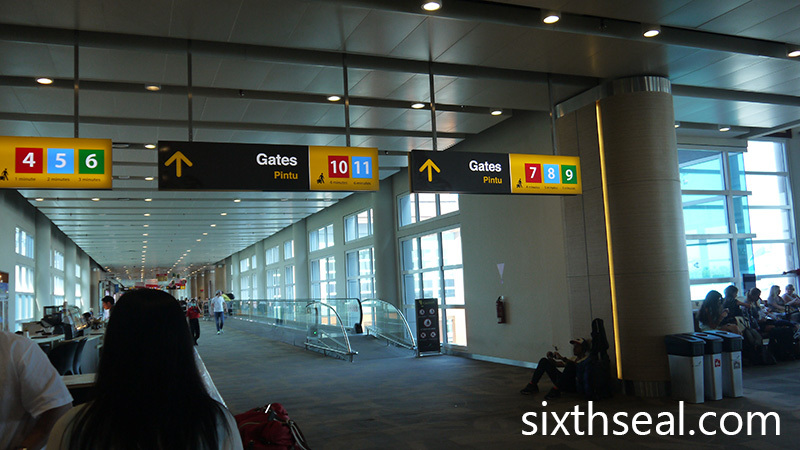 I assumed that I could travel back on the return flight and didn’t think to do anything until my better half told me she couldn’t check in for me and I wasn’t listed. After talking to a distinctively unhelpful Khairul (“I’m the only Khairul in Customer Service“) in Malaysia Airlines, it turns out that he couldn’t help and I decided to just rebook my return flight using AirAsia. I managed to get one slightly after my original flight for an additional IDR 1,512,350 – you need to pay in rupiah if you’re in Indonesia while booking online, it’s about RM 504. 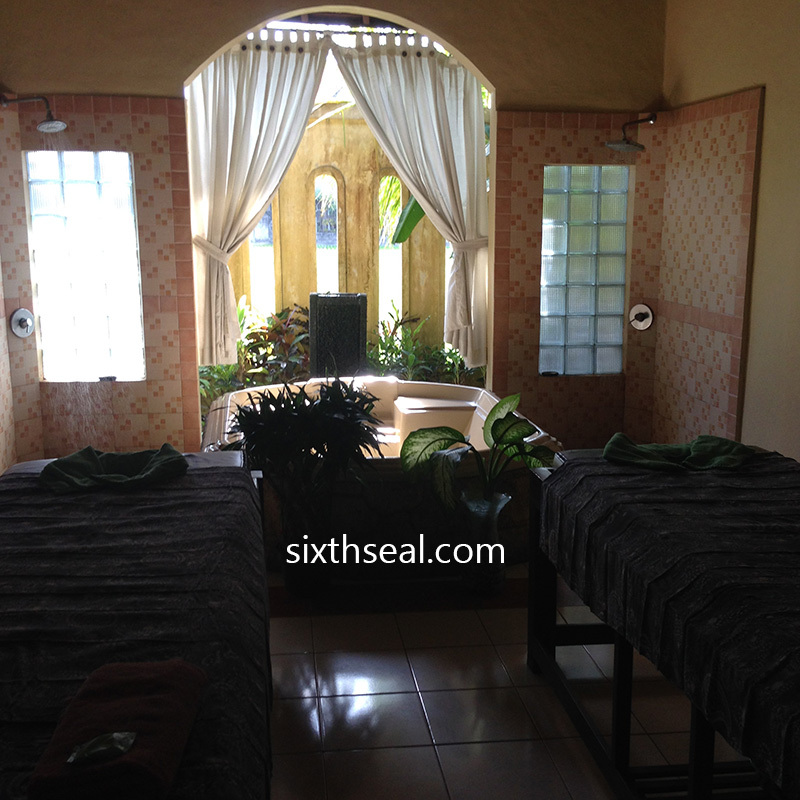 This was very late into the night, we had just came back from Venezia Day Spa & Salon in Ubud where the rather misleading Honeymoon Package (IDR 607,000) is the price for one, not for two. At least my better half thought it was for the both of us, I had suspected that it’s just a name and it’s the price per person. 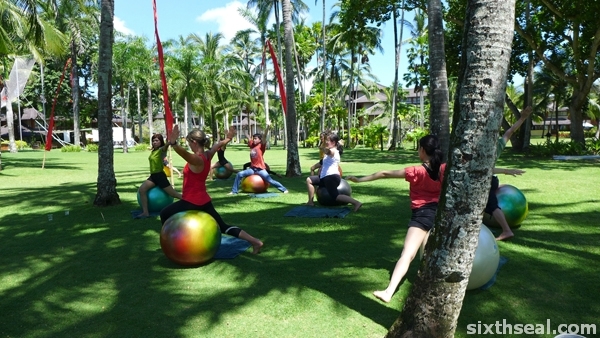 It turns out that the total price was IDR 1,214,000 or IDR 1,358,699 with 12% tax of IDR 145,680. It’s still decent for a 5 hour treatment since 1.3 million rupiah is about MYR 452 and the important part was that she enjoyed herself. I didn’t mind the treatments too, I’m just not used to these kind of things – my first manicure and pedicure. Anyway, after realizing late into the night that my return flight wasn’t secure, I had to quickly book another ticket back on the rather unreliable hotel WiFi – it took me the better part of an hour before the credit card payment went though. 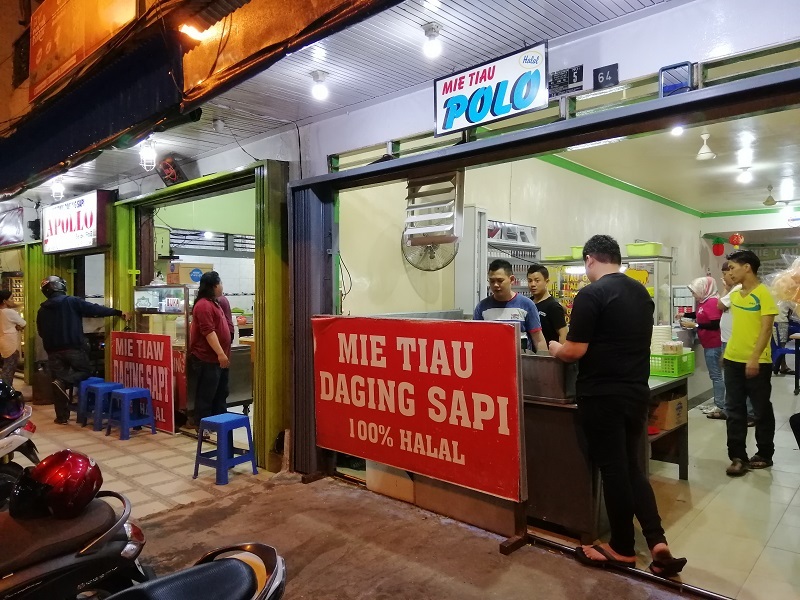 Bakmi literally means meat noodles and despite the Muslim majority capital of Indonesia, there are shops which caters for people who wants a dose of porcine goodness. 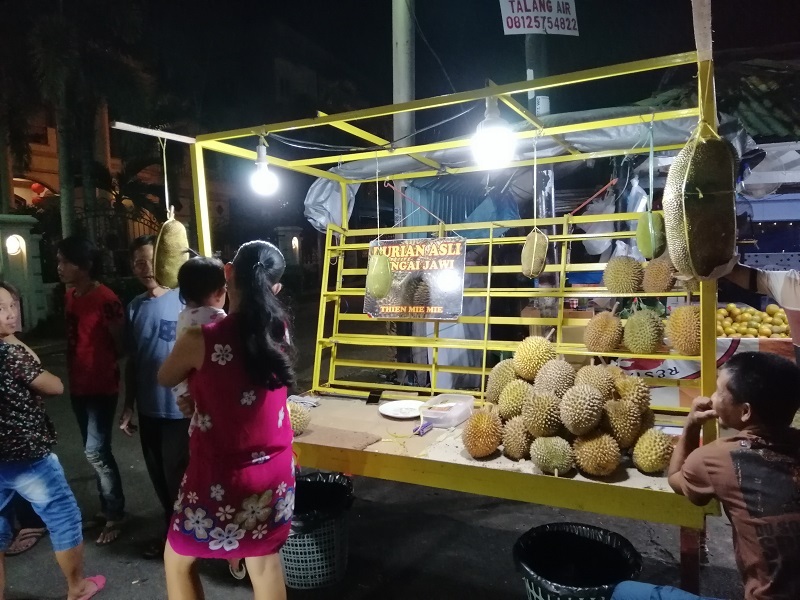 One of these is located in Mangga Besar – a quirky name which means “big mango” (a tropical variant of the Big Apple ;)). …and I can attest to that! 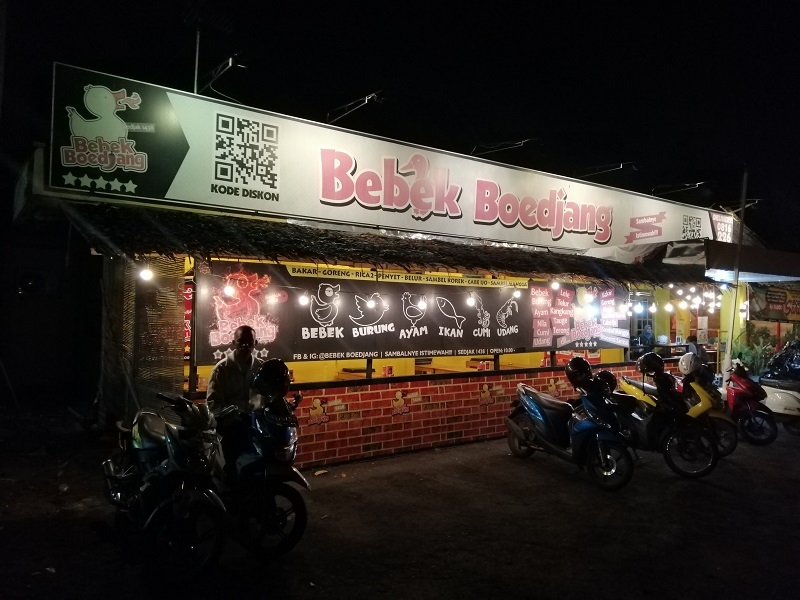 It has been around for a couple of years at least, a friend of mine brought me here to eat a very late supper when I was in Jakarta. The place was packed even though it was way past midnight. 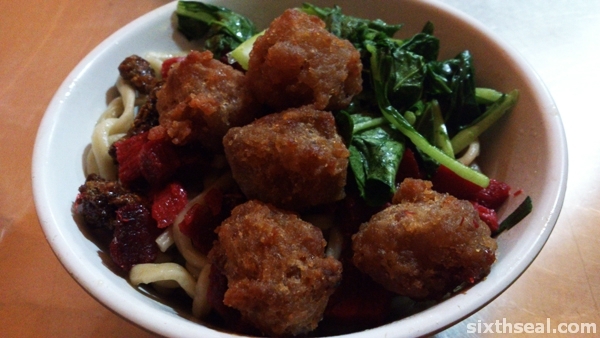 The bakso (that’s meatballs) accompanying the bakmi here is made with pork and it’s deep fried before being served, producing a crunchiness that goes very well with the juicy pork meatballs. They don’t skimp on the meat – there’s just a thin coating of batter on top. I reckon it’s the deep fried bakso that makes this stall stand out. The noodles are also tossed with lard and there’s bit of char siew (barbecued pork) and deep fried pork skin to go with it. 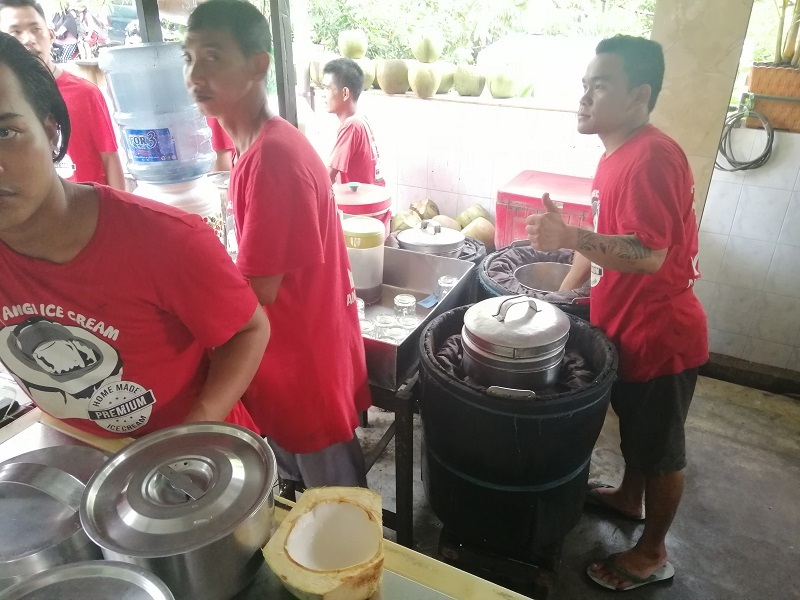 It’s also not fully “dry” – almost a quarter of the dish is filled with the seasoning gravy (or bumbu) which is a mixture of lard, soy sauce, and other things the workers are reluctant to divulge. However, it is 100% goodness! I have had a lot of pork noodle dishes and this is one of the times where it stood out in my mind. 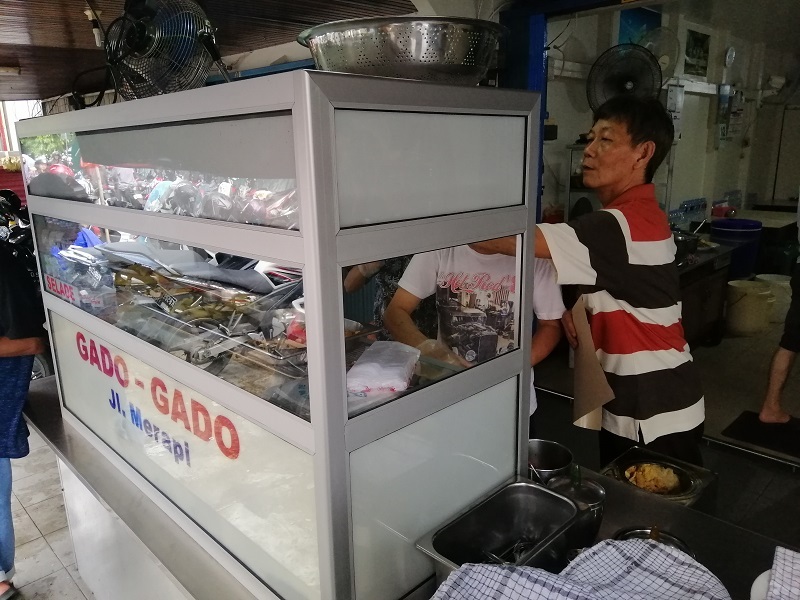 The bakmi in Mangga Besar is just one stall in a long chain but you can find it from the distinctive t-shirts that they wear. A large bowl of pork bakmi with extra bakso with a glass of iced jeruk (local Mandarin orange juice) from the stall beside just cost under 20,000 rupiah (about RM 6) – a nice break if you want something other than chicken in Jakarta. 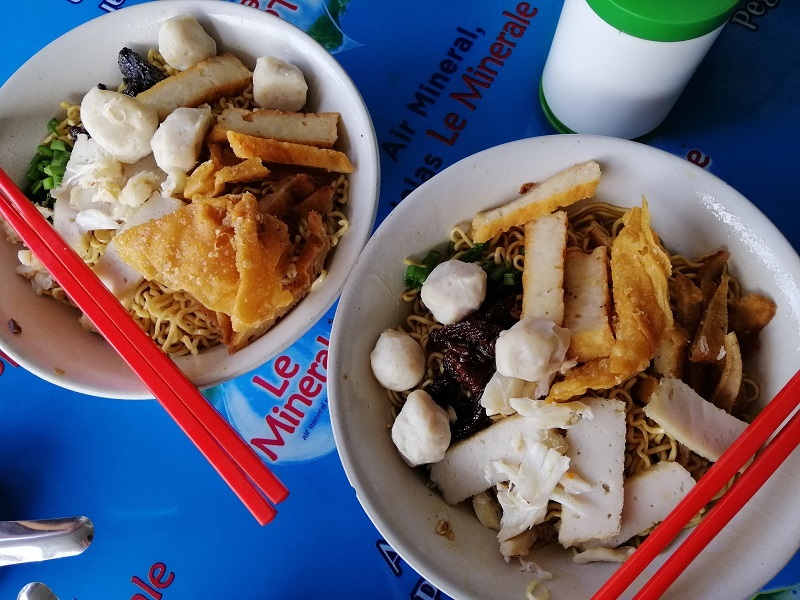 A mean and delicious dish of authentic roadside bakmi at a price that’s hard to beat. 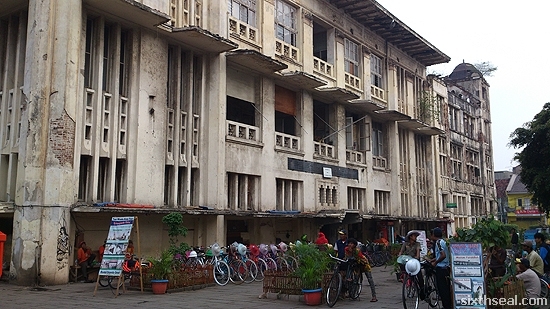 Kota Tua is loosely translated as “Old Town” and it’s the old part of Jakarta. It’s also known as Old Batavia and you can still see the scars of the 1998 riots here – burned buildings are still around and refurbishment hasn’t touched most of it yet. We were staying at a hotel just nearby and one morning, Jazz woke me up to experience the place. The streets were closed on that day, due to a function that’s happening on the square. 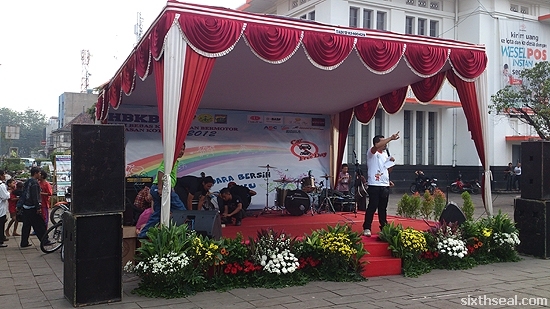 It was the event itself that caused the closure of the streets – it’s called Hari Bebas Kenderaan Bermotor Kawasan Kota Tua 2012 which translates to “(Motorized) Vehicle Free Day (in) Kota Tua Area 2012”. Heh. 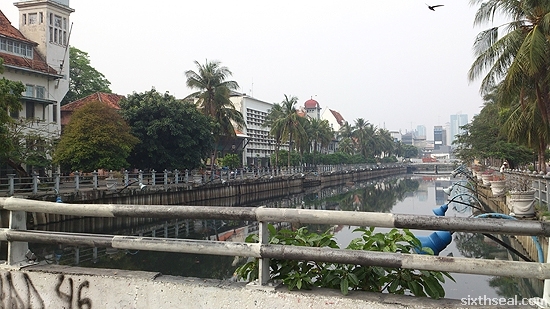 Kota Tua is bordered by a canal called Kali Besar which is famous for its overpowering stench. I could smell it, but it wasn’t anywhere as bad as I was told. 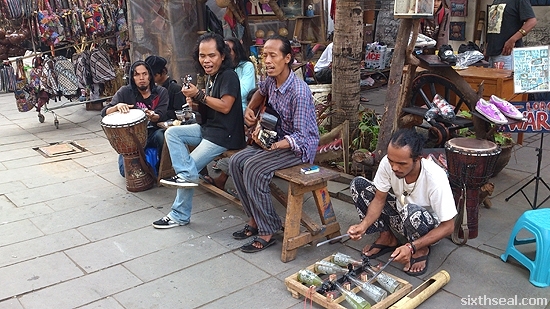 The beauty of Kota Tua Jakarta lies in its vibrant community of stalls and buskers – there were people playing various musical instruments and I even saw an improvised percussion system made of glass bottles nestled on a wood frame! This is one of the refurbished buildings – their post office. 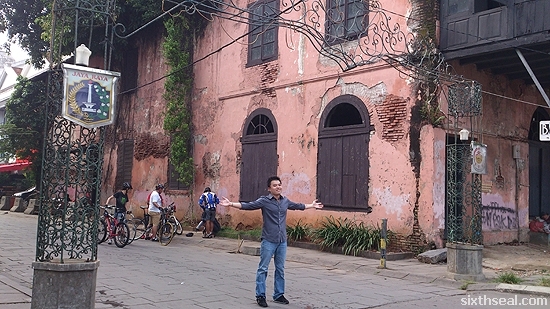 It’s part of their efforts at making this historical town into a UNESCO heritage site. 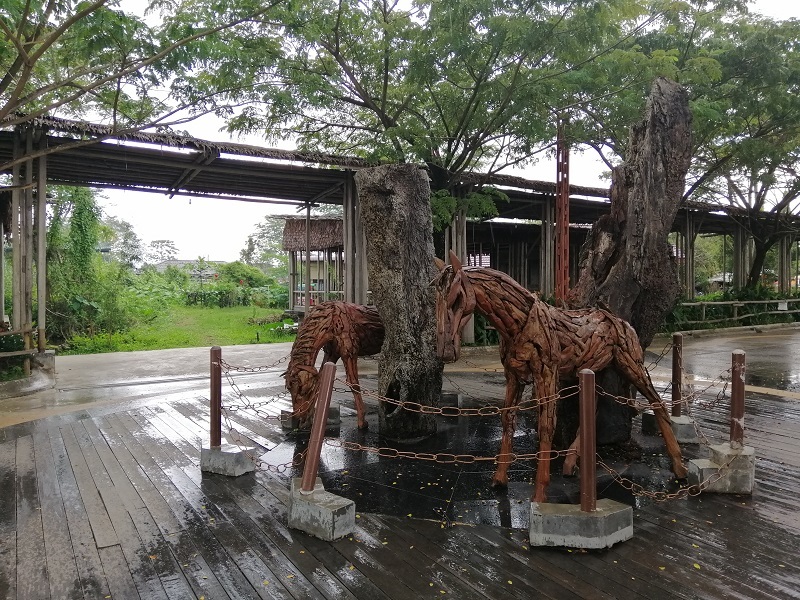 It is primarily a tourist attraction with it’s souvenir stalls – there’s also a theater called Museum Wayang there that plays traditional Indonesian Wayang Kulit (a shadow play with puppets). Several vendors also offers rides on pimped up (or rather dolled up) bicycles for two, complete with flowery hats. 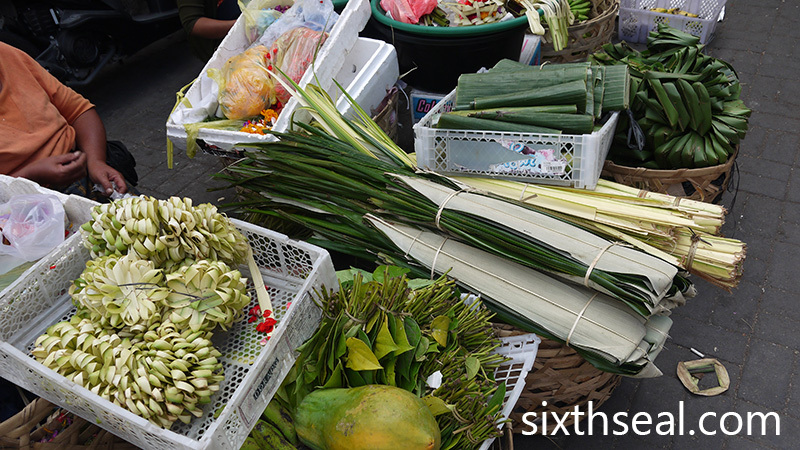 However, it’s definitely worth a visit – you can catch a local puppet show or grab a snack from a roadside stall. I had Otak Otak Ikan which is completely different from the soggy fish paste we get here. The Indonesian version of otak otak is crispy and eaten with a chilli paste. It’s cheap street food, I think I paid less than RM 1 for this. 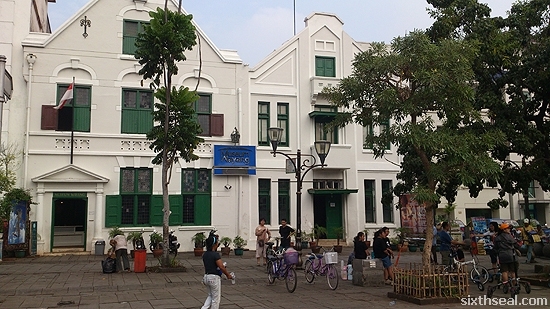 Kota Tua Jakarta has something for everyone. 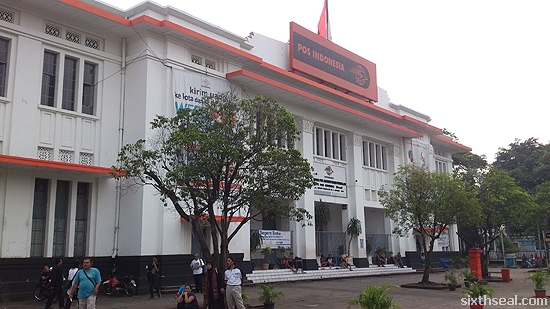 It’s called Old Jakarta for a reason – a lot of history and heritage can be found in this area. I’ll allocate at least half a day for a proper visit, and a full day if you want to pop into all the museums and catch a wayang kulit show. 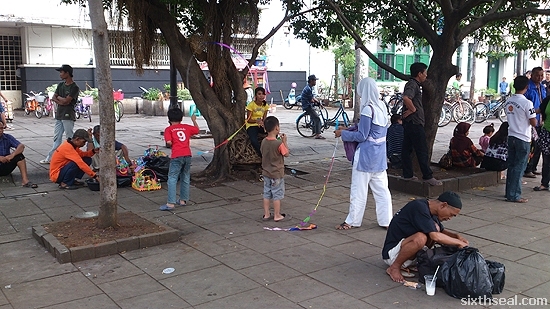 …or you can just sit at one of the cafes and watch the vibrant scenes – families at play, people collecting discarded cans for recycling money, old men chatting animatedly while standing around in loose circles. 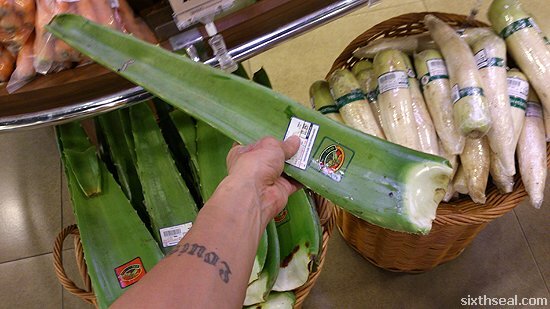 It’s called lidah buaya in the local parlance, except these monstrosities grow up to 2 feet long (!). The shortest one is easily 1 1/2 foot and the girth is pretty impressive too. 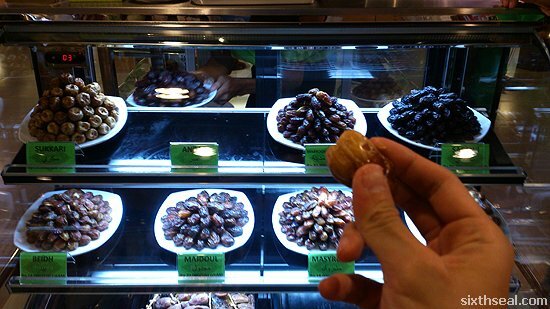 The appearance of dates means the fasting month of Ramadan for Muslims is around the corner. Sukkari dates hails all the way from Medina in Saudi Arabia and it’s hard, dry and intensely sweet. 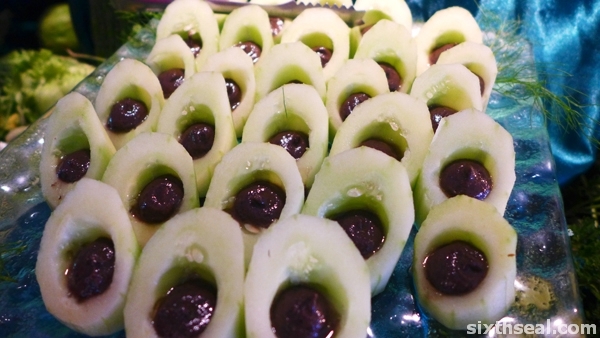 The appearance is conical and Sukkari dates are considered a delicacy – premium items that’s very much in demand according to the people at Hero (a grocery store chain in Jakarta). It retails for IDR 35,000 (RM 12) for 100 grams and I ate a couple thanks to the person manning the place. 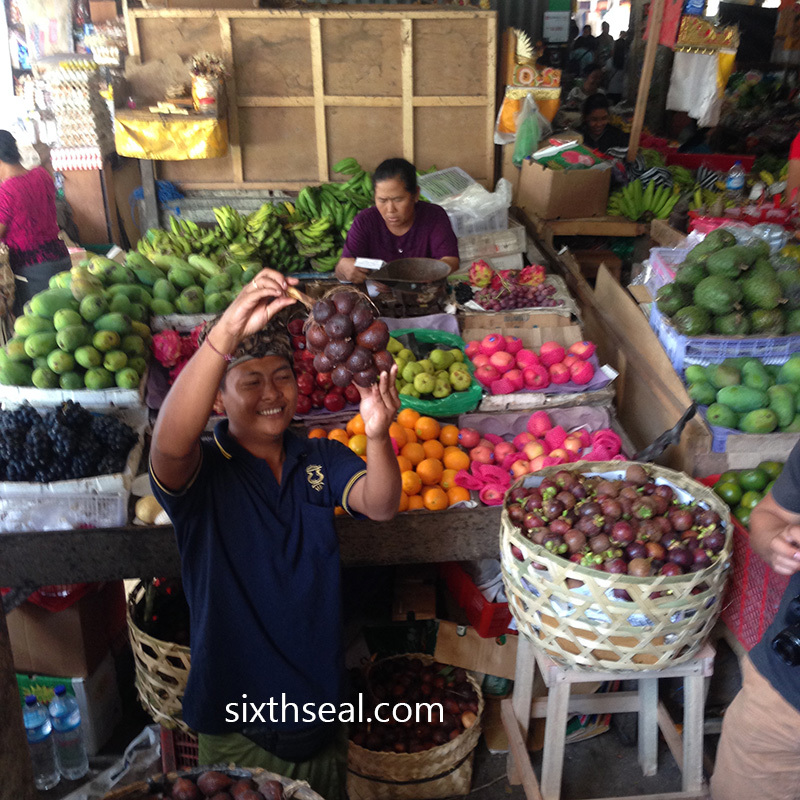 They also sell Anbara dates – the largest date species in the world, and the polar opposite to Sukkari dates texture-wise. I had Anbara dates a couple of years ago and it’s soft and chewy unlike the “grainy” mouthfeel of Sukkari dates. This is something I’ve never seen before despite trawling the specialty grocery stores back home. It’s simply called “short taugeh” and you can see the bean with just a hint of sprout. 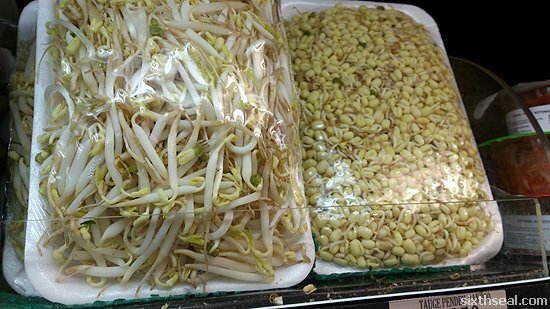 The unusual retarded sprouting process is pictured next to regular bean sprouts for comparison. It looks like an adolescent trying to grow facial hair.